If you are interested in adding any of these lamps to your collection, please drop a line to R. C. Finch, 299 Allen Hollow Rd., Cookeville, TN 38501,or e-mail me at rfinch@tntech.edu Lamps marked "NLA" are no longer available. 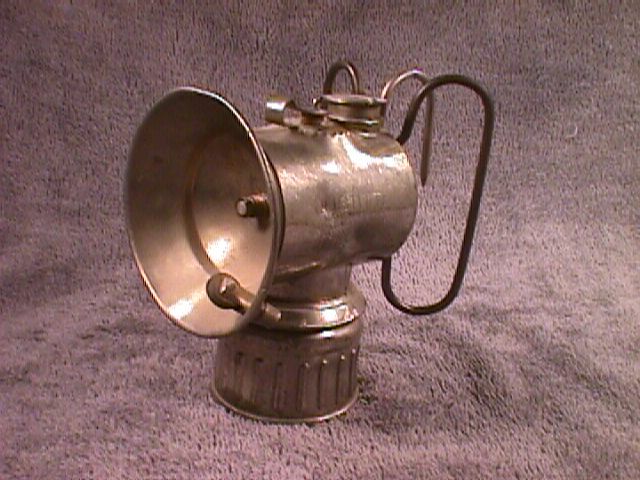 AC-1: ACME HAND LAMP, UNFIRED: [NLA] A lightly tinned steel hand lamp, ACME brand, made by Justrite Mfg. Co. of Chicago, mainly for use in hardrock mines. I believe this to be half-shift lamp Model No. 50 (50A), Type 2A. 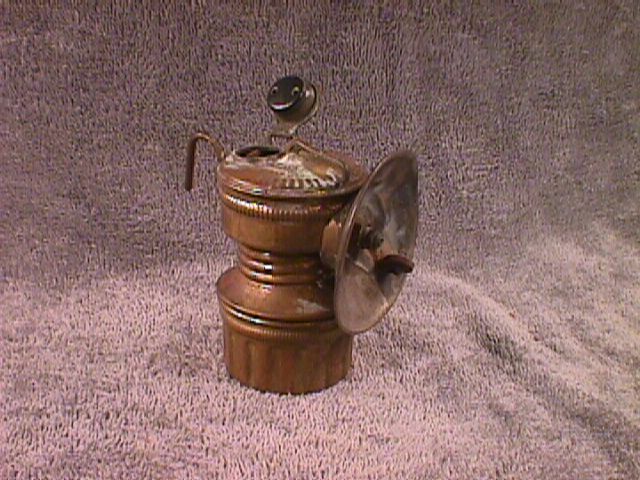 Lamp stands 6" tall to top of water valve control knob, which is marked "Wire Feed"; water tank has vertical ribs; the name Justrite is stamped in the water tank top just above the brand name Acme; has handle and hook and bail for hanging. Interesting feature: knurled screw on bail can be screwed into threaded hole in water tank to fix the bail in the upright position (in the photo it is shown with the screw unscrewed and the bail released and tilted back). A good deal of the thin plating on the body is gone (maybe 25%)-- I suppose from age-- but the plated reflector is perfect. This is because this reflector is not original to this particular lamp. However, it seems to be a correct replacement: 4" diameter, no indentation to prevent rotation. ACME HALF SHIFT LAMP, unfired. AR-1: ARROW CAP LAMP: [NLA] A standard nickel plated Arrow cap lamp; 2 3/8" set screw reflector; hook and wire braces intact and in good condition; round bottom identical to early Auto-Lites. Lamp is complete except the felt plate is homemade; very likely functional, though I never fired it up; a good deal of the nickel plate is worn through; one pretty good ding in the bottom. 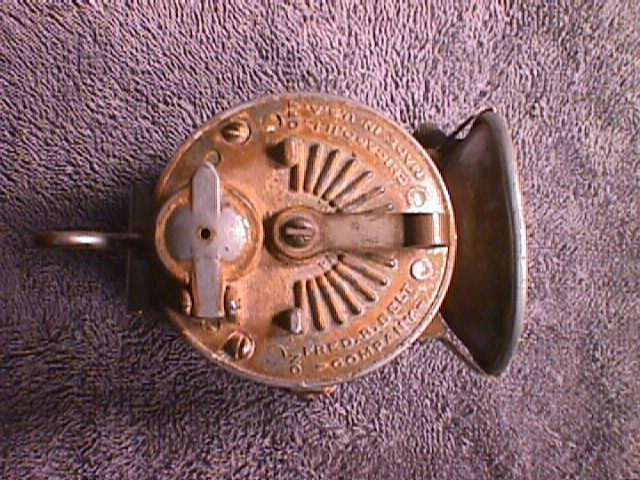 Top view, ARROW CAP LAMP. 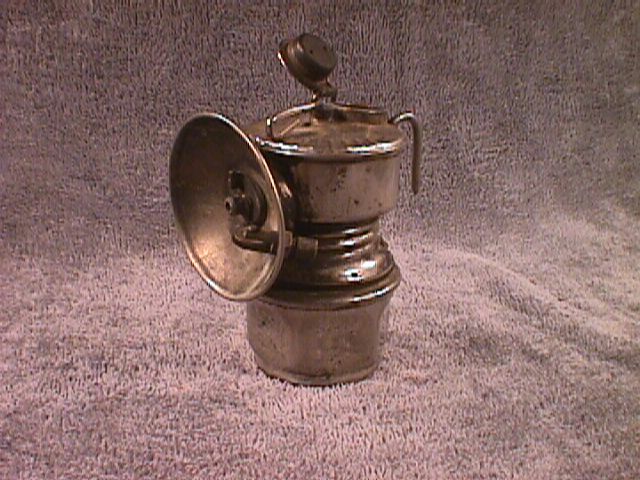 AL-1: AUTO-LITE: EARLY, INCUSE, SUPERINTENDENT'S LAMP: [NLA] This nickel-plated lamp is the size of a cap lamp (just 3 1/2" tall), but is equipped with "butterfly" handles, so likely a superintendent's lamp but perhaps a lamp for camping. 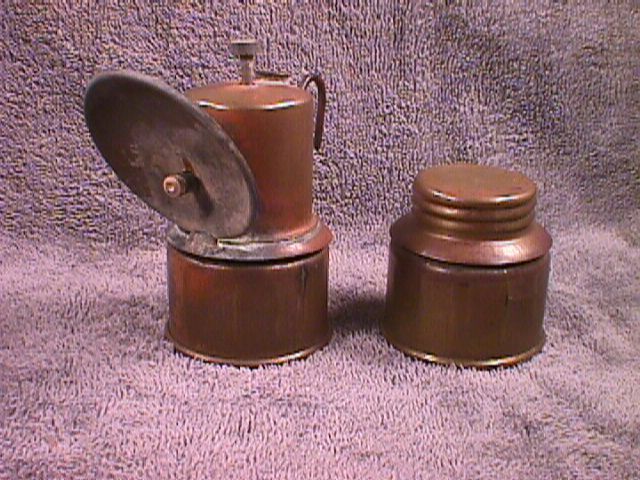 Reflector is a deep bell-shaped reflector, but small, just 2 1/4" in diameter; striker unit is missing; burner tip is unjacketed "lava". Base is the round style with two reeded bands, and no markings whatsoever on it. 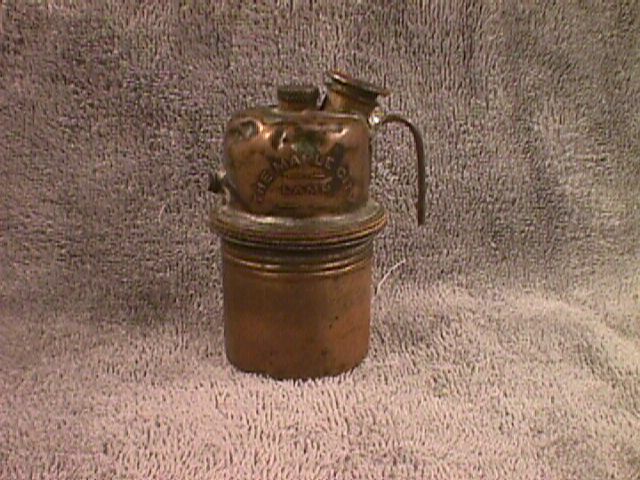 The name Auto Lite and Universal Lamp Co. appear in incuse letters on the top of the water tank, which is otherwise smooth, having no water valve control notches. Lamp has one dent about 1/2" across in the water tank top, plus a smaller one. Nickel plating is remarkably good. Comes with a screw cap for the base. Lamp history: Once part of the Peter Hauer collection. 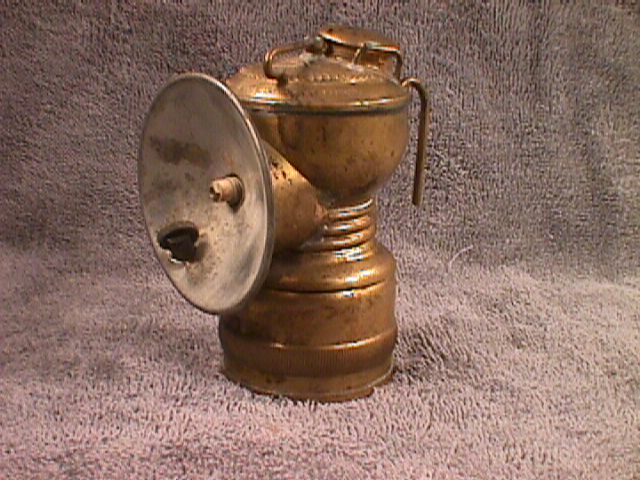 AUTO-LITE SUPERINTENDENT'S LAMP, side view. 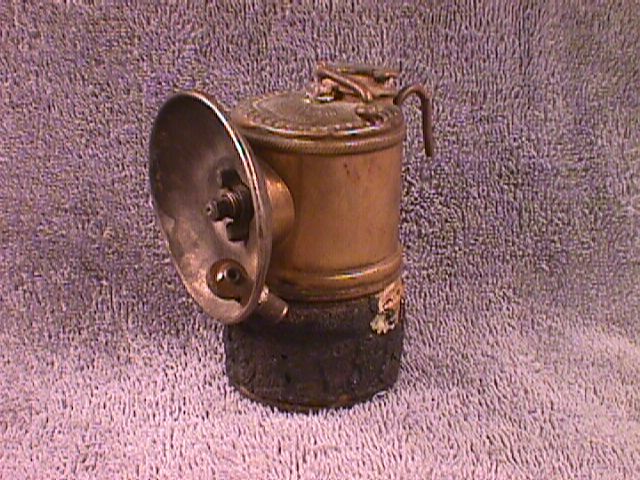 AUTO-LITE SUPERINTENDENT'S LAMP, from above. 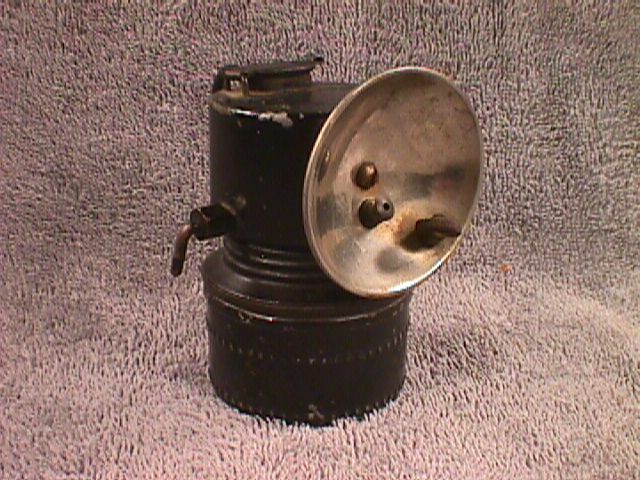 AL-2: AUTO-LITE CAP LAMP with rare FIRST GENERATION "BUMPERGRIP": [NLA] An ordinary, but nice condition "Chicago" Auto-Lite cap lamp. What makes this item extraordinary is the "Bumpergrip", which is made of a dark brown rubber, and has a completely convex outside profile (not stepped like the normal "Bumpergrip" we all know so well). The rubber seems to be softer and more "rubbery" than the later red and black "Bumpergrips" that tended to harden and crack with age. This "Bumpergrip" matches precisely the "Bumpergrip" design depicted in the patent sheets for the "Bumpergrip" patent. I wonder how many of you have seen one of these before? Unfortunately, the difference between this first generation "Bumpergrip" and the later well-known models does not show as obviously in the photos as it does in life. Oh well.... A scarce item, I'll warrant. 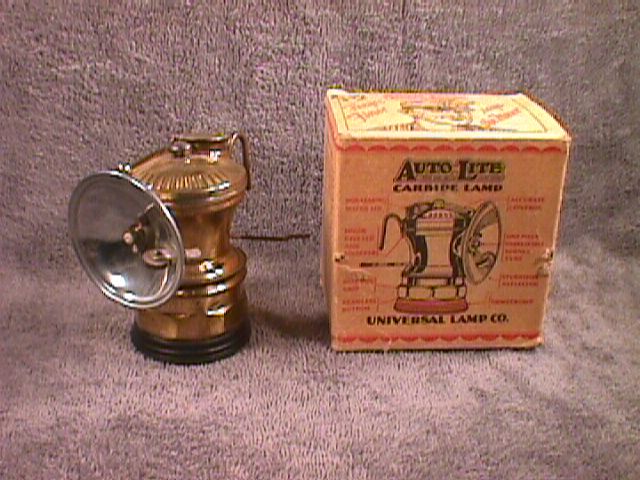 AUTO-LITE CAP LAMP with ORIGINAL "BUMPERGRIP". Close up of ORIGINAL STYLE BUMPERGRIP. AL-3: AUTO-LITE CAP LAMP with NARROW SPADE and RED "BUMPERGRIP": [NLA] Well, the title about said it all. 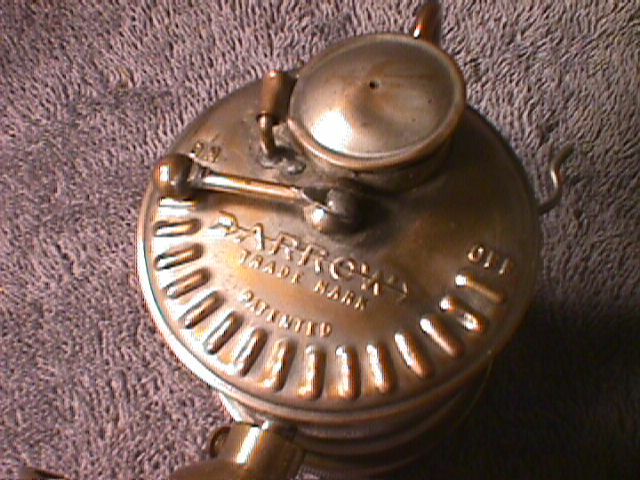 This is a "Chicago" Auto-Lite (i.e., the Universal Lamp Co.'s Chicago address is given on the top of the water tank), and features the attractive base style that has Auto-Lite embossed on the bottom in large raised letters (Universal's style before going to the less attractive thin-letter base stamping). Early red "Bumpergrip" has a lot of cracks, but is intact and stays put on the base. Spade mount is the less common narrow spade. Complete except for felt plate and felt holder. 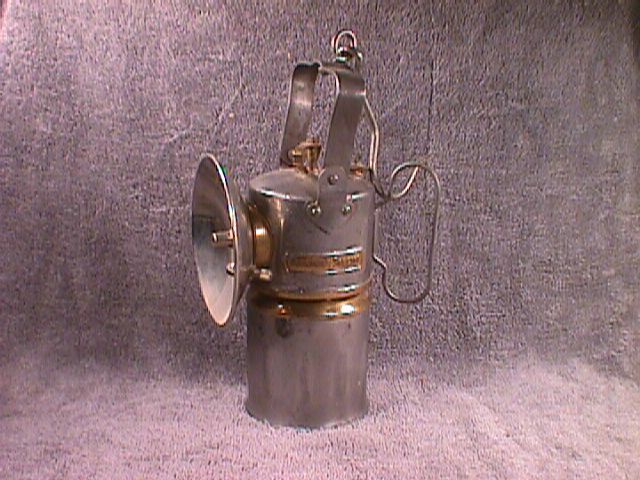 AUTO-LITE CAP LAMP with NARROW SPADE MOUNT. AL-4: AUTO-LITE CAP LAMP with SPADE MOUNT: [NLA] A late model Auto-Lite cap lamp with standard short wide spade mount. Reflector is 3" diameter, and has one crease in it where someone ran into the mine back or a mine timber. Complete with felt holder and plate. Heck, I may just keep this for caving. We'll see. AUTO-LITE CAP LAMP, SPADE MOUNT. 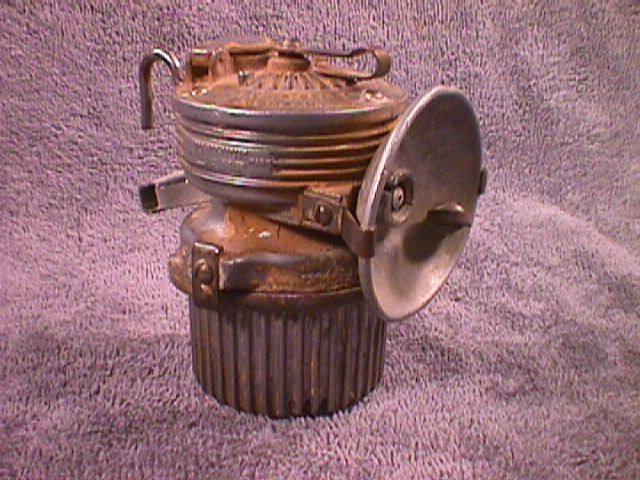 AL-5: AUTO-LITE CAP LAMP, MODIFIED: This Auto-Lite came out of the Cumberland Plateau coalfields in the late 1960s. 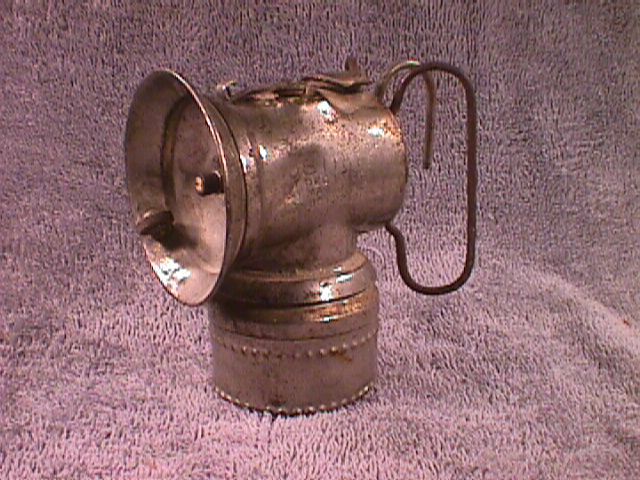 We had more out-of-work miners then than employed, and this lamp has been modified for "spotlightin'", i.e., night hunting, very likely by a former miner. The original reflector ("'flecter", as the miners 'round here were wont to say) has been replaced by a large brass reflector taken out of a pre-sealed beam vintage automobile headlight. This reflector has been neatly modified to fit the Auto-Lite reflector brace and be held in place by the original reflector wingnut. In the photo some light corrosion obscures the center of the reflector; this corrosion has built up during the years this lamp has sat in my collection, and is light and should be easily removed. AUTO-LITE CAP LAMP, with HOMEMADE REFLECTOR. 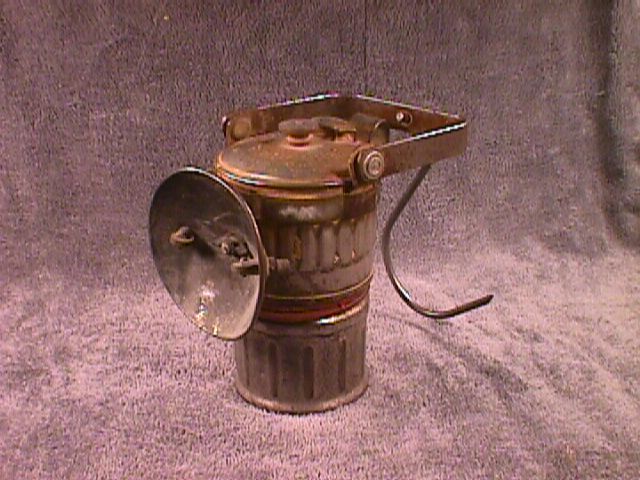 AL-6: AUTO-LITE CAP LAMP, UNFIRED: [NLA] Standard, late model Auto-Lite cap lamp with hook and wire side brace mount, 2 1/2" plated ref., "Bumpergrip", etc. Complete, never fired, condition perfect (dare I say "mint", why YES!). Complete with original box. The box has yellowed a bit with age, and has some minor damage, mainly where the wire side braces poked holes in it during handling. Original store price $3.98 marked in black crayon on top flap. 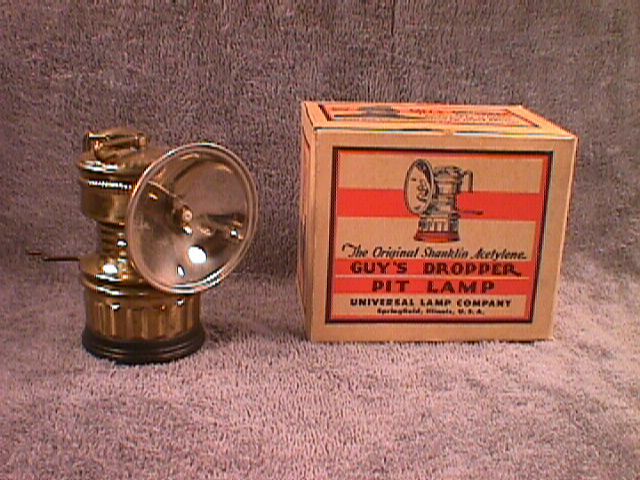 AUTO-LITECAP LAMP, unfired, with original box. 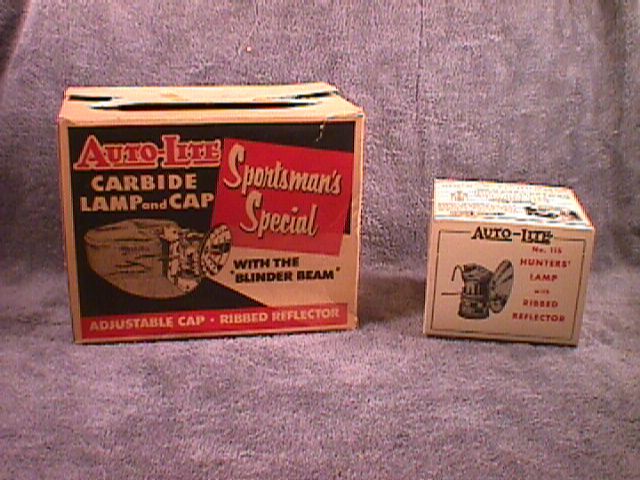 AL-7: AUTO-LITE "SPORTSMAN'S SPECIAL" LAMP and CAP, UNFIRED: [NLA] This is Auto-Lite No. 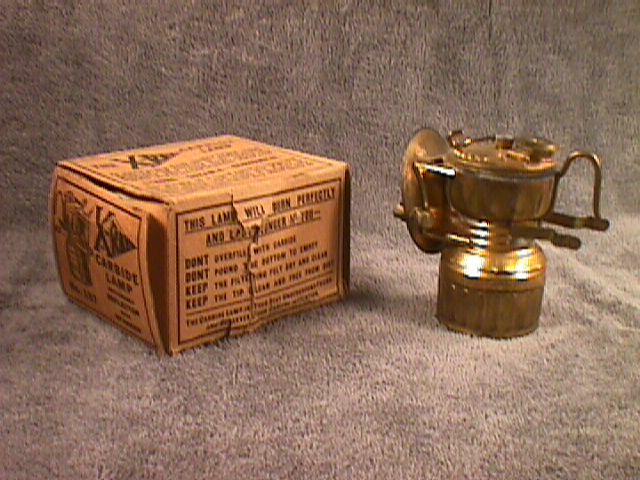 115 "Hunter's Lamp" with the ribbed reflector, specially boxed: lamp comes with its own box; this is inside a larger box which contains a cloth hat with mounting brace. Lamp and lamp box and cloth cap are perfect, never used. Outside box has darkened some with age, but otherwise has only very minor flaws. AUTO-LITE No. 115 and soft cap. BW-1: BALDWIN CAP LAMP, UNFIRED: [NLA] Early "pinchwaist" Baldwin with raking wire and 2" diam. push-on reflector, and wire side braces that do not clamp. 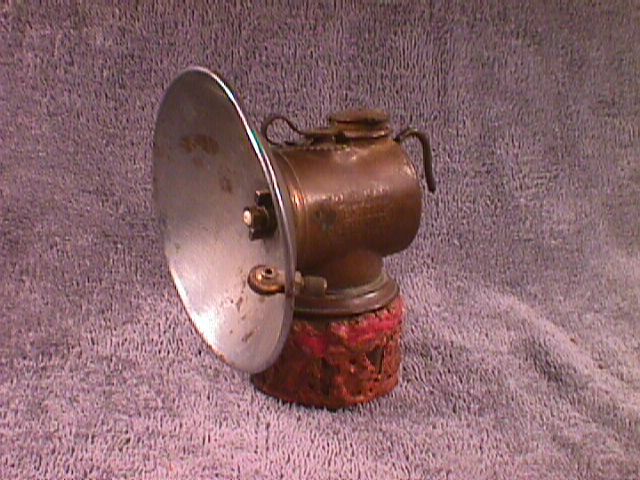 Plating on reflector was very thin to begin with and is gone from age, but not from use: this lamp has never been fired, and is totally original and complete, including felt and felt holder and lava tip with the Simmons diamond trademark. Lamp history: This lamp was originally bought for use at Cudjo's Cave, a commercial cave at Cumberland Gap, Va. It passed into the hands of the operator of Bristol Caverns (Bristol, Tn.-Va.), then to Roy Davis, renowned caver and operator of Cumberland Caverns (McMinnville, Tn.). I traded Guy's Dropper lamps and parts to Roy for Baldwin, a Zar, and a Grier Bros. in the mid 1960s. Early BALDWIN CAP LAMP, unfired. Unfired BALDWIN CAP LAMP, top view. 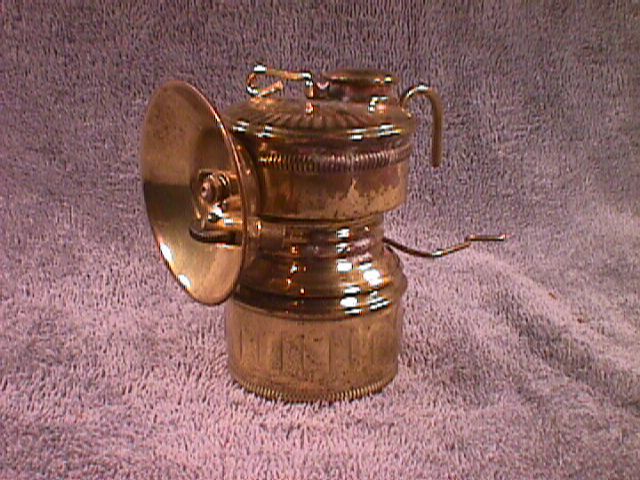 BW-2: BALDWIN SUPERINTENDENT'S LAMP: [NLA] Nickel plated "pinchwaist" Baldwin with hook and folding handles, 3 7/8" tall to the top of the raking wire. Presumbably a later model than the above lamp, because a screw-down positive shut-off valve (well, until the rubber hardened it would have been a positive shut-off) has been added instead of just a simple raking wire in the water feed. Complete right down to the lava tip with the Simmons diamond trademark and internal parts like the felt plate, and in excellent overall condition. Two flaws: one stress crack in apron at base of tank, and the push-on reflector is not original with this lamp. It is very old, has the incredibly thin plating typical of Simmons reflectors, is very similar to other Baldwin reflectors I have seen, fits right, and may well be a correct replacement...I cannot say with 100% certainty. Looks good on this lamp, anyway. 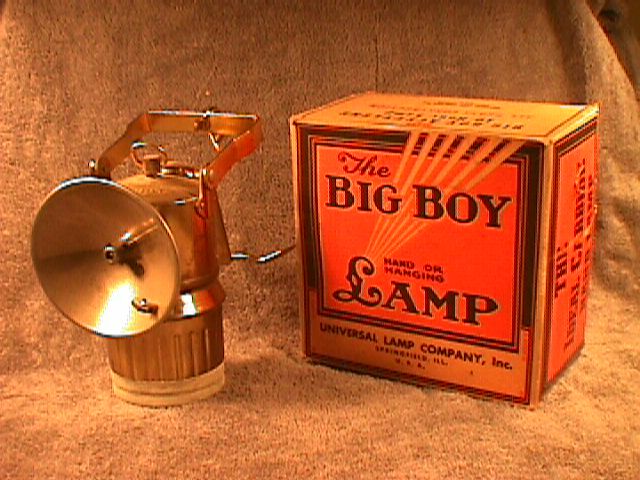 BB-1: BIG-BOY FULL-SHIFT LAMP, UNFIRED, with ORIGINAL BOX: [NLA] A brass "hand or hanging lamp" by the Universal Lamp Co., advertised as a 10-hour lamp, which would make it actually longer-burning than a typical full-shift lamp. Big-Boy stands 6 1/2" tall to the top of the water control, is brass throughout, but has a steel reinforcing plate on the base, probably to minimize denting when the miner knocked the spent carbide out. Has a plated 3 7/8" deep-dish reflector, complete with lighter and flame guard over the burner. 100% complete and 100% original, including the box...I bought it off the shelf in a mine supply store in the hard rock mining district of Spruce Pine, N.C., in Aug. 1966 for $4.30. BS-1: BRILLIANT SEARCH LIGHT BELT GENERATOR AND HEADLAMP: [NLA] Manufactured by the Brilliant Search Light Mfg. Co., of Chicago, one of Justrite's local competitors! Complete and in good condition, even the leather headband is in good shape; I believe you could fire this one right up with no problems. Both the main lens and bullseye lens are perfect. Hose is good (could be a replacement, but if so, not by me). Quite a few chips in the black paint, affecting the label to some extent; I'd estimate the label to be 75%+ intact. BRILLIANT SEARCH LIGHT, side view, with bullseye lens swung aside. BRILLIANT SEARCH LIGHT, viewed from above, with bullseye lens closed. 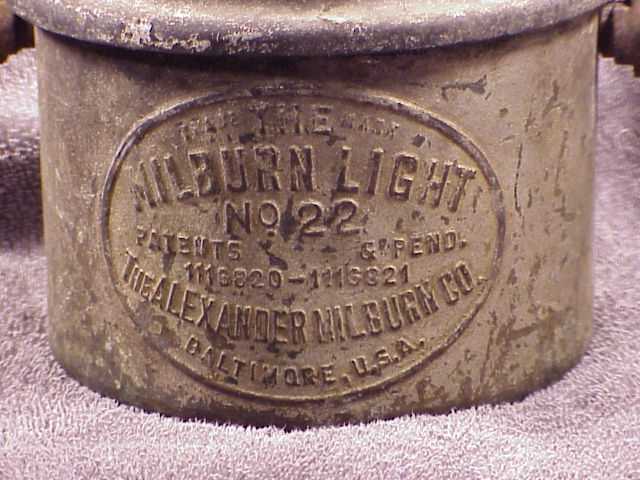 BL-1: BRITE-LITE CAP LAMP: [NLA] Their advertising slogan, found on the top of the water tank, was "A Different Lamp", and they weren't just a whistling Dixie (a highly improbable act on the part of the Ohioans of the Harker Mfg. Co., in any case). This is the "American Bull Dog No. 150" model depicted in advertising in 1917. It appears to be constructed of steel, finished at the factory in black paint. 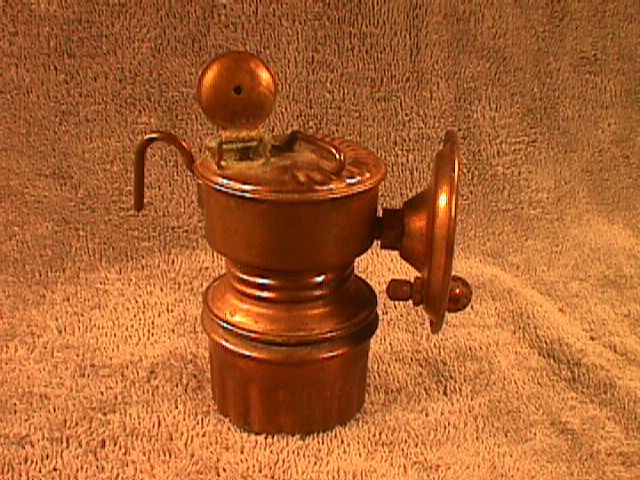 Other unusual features include: water feed controlled by a side-mounted valve lever; off-center lava burner tip aimed up through the reflector at an angle; reflector held on to water tank by a small screw through the center; elongate lima-bean-shaped water fill port. Lamp is 3 1/2" tall to the top of the water door. Two flaws: side mounting braces have been snapped off; bottom is "frozen" on, perhaps by being stuck to the gasket. This bottom could probably be removed if someone was clever and careful about it; I have not attempted to force it for fear of damaging the black paint finish, but if someone were to carefully pick the gasket out with some sort of probe... Anyway, a very rare and desirable lamp. Lamp history: Don't know any particulars, but probably used in the coal fields of southern Kentucky. I picked this lamp up, along with the Maple City described later in this list, and an odd Guy's Dropper, for $4 plus a teapot oil lamp, at a junky antique shop run by a sheriff in Whitley City, Ky., Aug. 1967. Years later I drove back through and stopped in again asking about carbides. He said he didn't have any good ones, that some feller in a little old foreign car had got all his good ones. He was obviously regretting this, so I thanked him and slipped away without letting him glimpse my 51 MG-TD again. 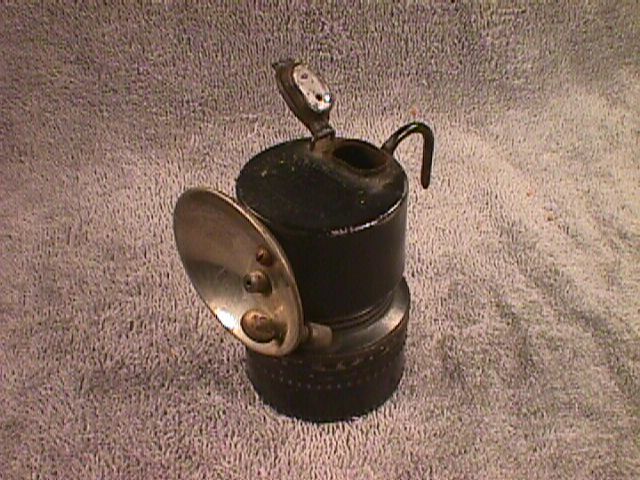 BRITE-LITE CAP LAMP, side view. BRITE-LITE CAP LAMP, viewed from above. 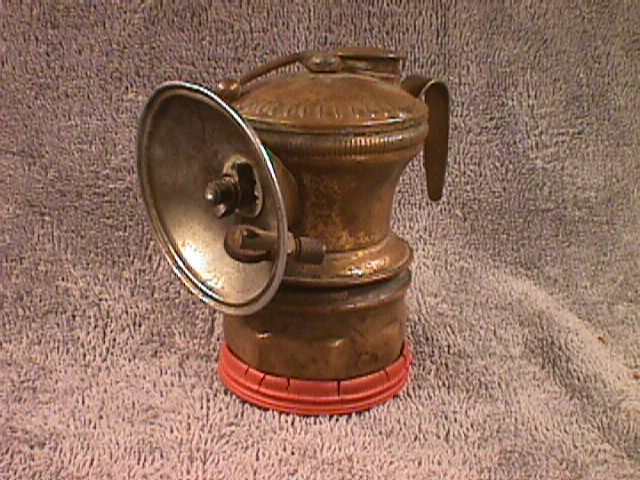 BD-1: BUDDY CAP LAMP: [NLA] Brass Buddy carbide cap lamp, 4" tall to the top of the water valve control knob; octagonal base, 2 1/2" plated reflector (with most all the plating worn off) held on by a hex nut. Lamp is complete and in good shape, except that the two wire side braces have been broken off, as is commonly the case. 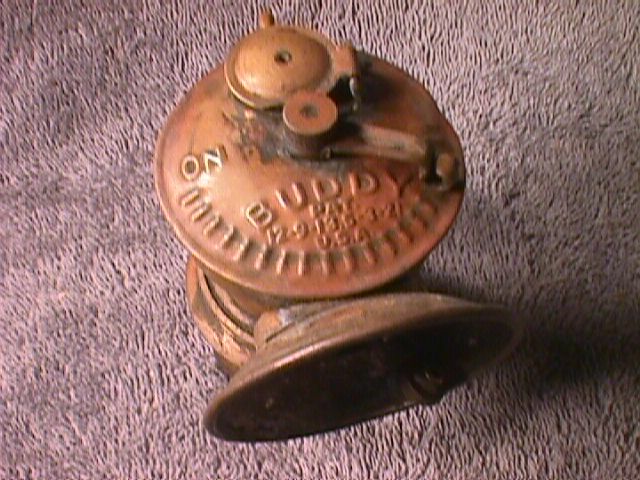 BUDDY CAP LAMP, side view. 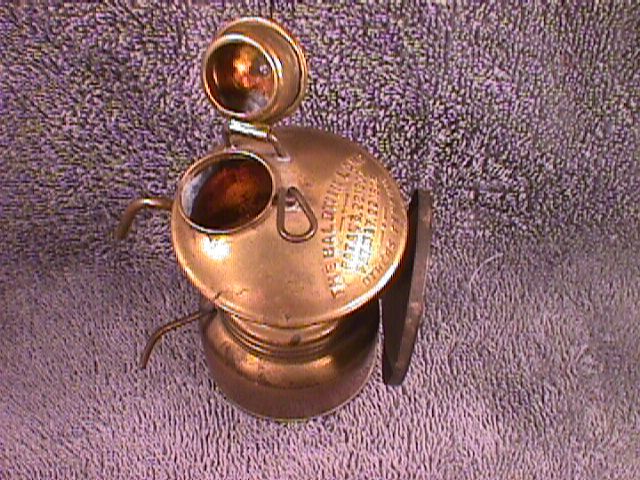 BUDDY CAP LAMP, top view. 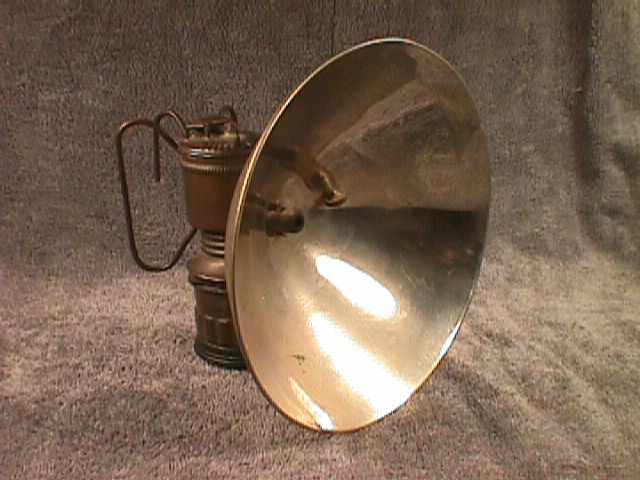 CR-1: CRESTELLA HAND LAMP, UNFIRED: [NLA] Manufactured by Premier Lamp & Engineering Co., Ltd., Leeds (England) for use in wet mines, this hand lamp is fitted with a conical metal umbrella, and stands 11" tall to the point of the umbrella. It is unfired and in very fine condition, but is missing three items: a round maker's plate that originally adorned the umbrella (probably very similar to the one still on the back of the lamp cannister); and it is missing a glass chimney and chimney ring. See Pohs' big book, pg. 589 to see what the chimney looked like. The second photo below shows the very interesting interior of this unusual lamp. 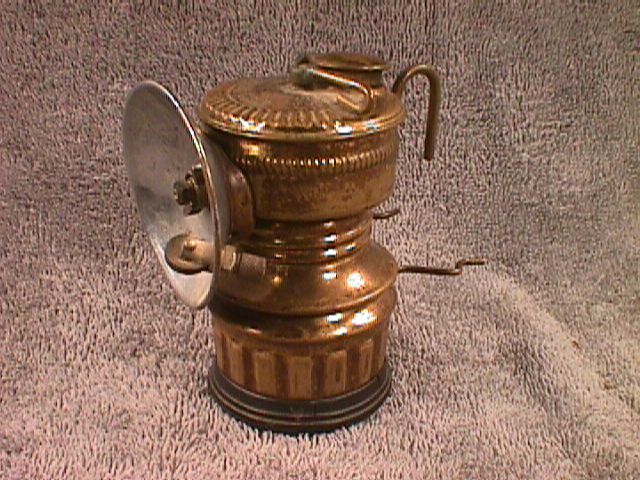 A lamp rarely seen in the U.S.
CRESTELLA HAND LAMP, front view. 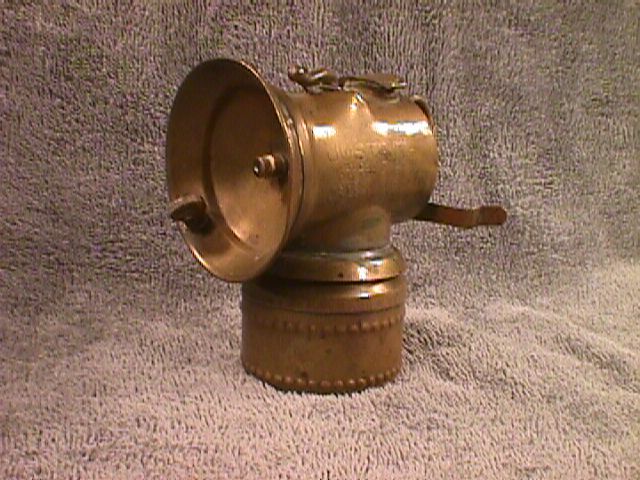 DW-1: DEW-R-LITE BRASS 8-HOUR LAMP: [NLA] This full-shift lamp by the Dewar Mfg. Co. of Brooklyn is a truly nice lamp; it appears to have had carbide in the base at least once, and probably has been fired, but let me tell ya, a fired lamp doesn't come any closer to pristine than this: no dings, no scratches on the reflector, nothing missing, hook is real sharp and probably has never been stuck in a timber, even the felt looks new! Lamp stands 7" tall to the top of the valve stem, has hook and bail for hanging, and vertical handle for carrying by hand. Reflector is 3 1/2" in diameter, has its lighter unit, and the original tip is in place under Dewar's distinctive screw-on flame protector. Made of a nice, heavy gauge brass. 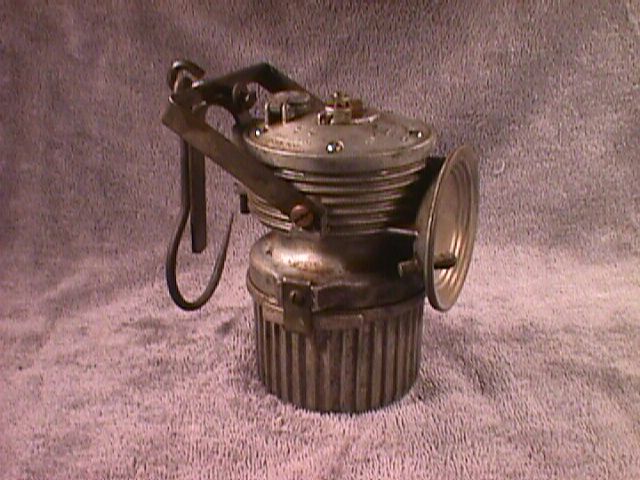 DEW-R-LITE 8-HOUR LAMP, side view. EL-1: ELKHORN CAP LAMP: [NLA] Brass Elkhorn, just under 4" tall; 2 1/2" unplated brass reflector in good shape, complete with lighter. This lamp has seen some rough usage: missing felt plate and holder; wire side braces broken off; water valve stem stuck in one position; bottom of base is pretty badly beaten up, apparently by the miner knocking spent carbide out; 2 stress cracks in bottom. Still, a basically not bad example of an uncommon marque. 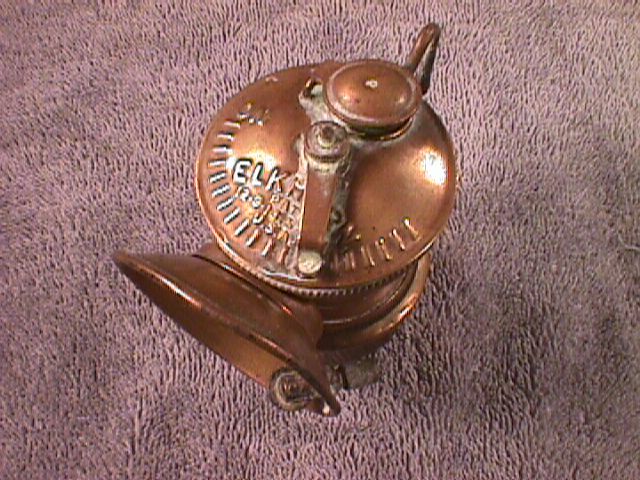 ELKHORN CAP LAMP, top view. 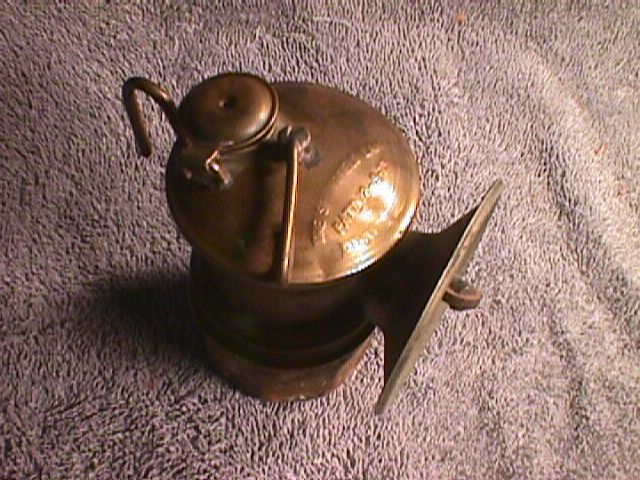 ELKHORN CAP LAMP, side view. FS-1: FLEMINGS SPECIAL: [NLA] This galvanized steel 8-hour lamp stands 7" tall to the top of the brass valve stem; it is equipped with a 4" plated reflector, and the tip is protected by a screw-on flame protector. Lamp has a hook and bail and folding "butterfly" handles as well. Brass trim includes the reflector brace, the valve stem, the screw-in water door (held by a chain), and both male and female threads joining the water tank and base, plus a nifty little plaque soldered onto the left side of the water tank that says "Flemings Special". 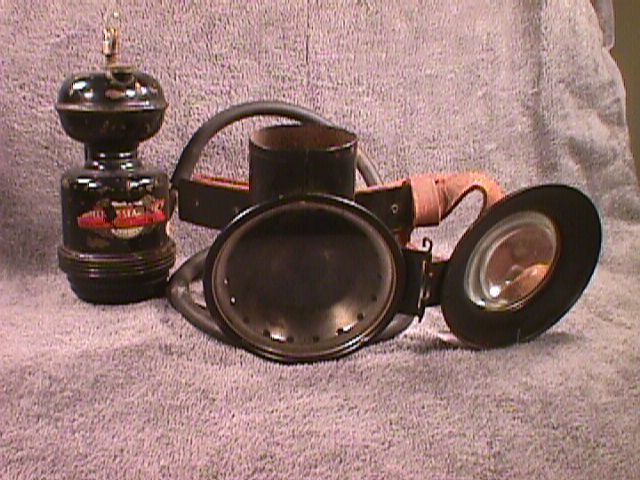 A rare handlamp in the US. Unfired and as perfect as they come. Lamp history: Made in Germany by special order for P. M. Fleming of Haileybury, Ontario, who operated a mine-supply business. In the late 70s, I bought several of these from his son, Richard J. Fleming, who wanted to sell me all his remaining stock (not many), but I couldn't hack it at $25 a pop in 1979. 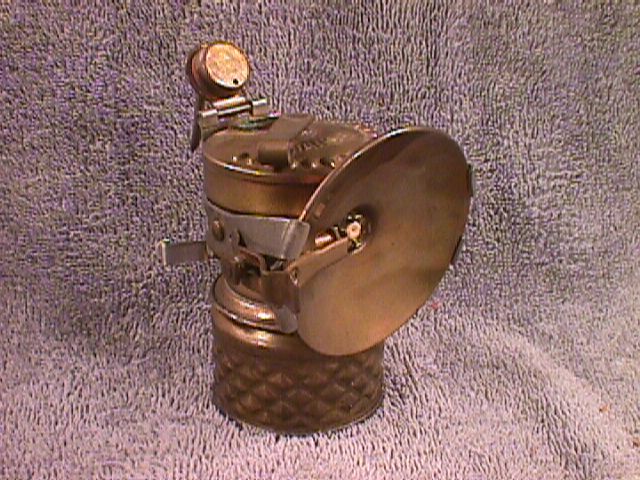 FF-1: FORCE FEED CAP LAMP: [NLA] One of Augie L. Hansen's beautiful lamps, the Force Feed has the same gorgeous "quilted" base as the Hansen lamp, and indeed the same body design, screw-in burner tip, stout reflector brace and mounting bracket as the Hansen. But the Force Feed's claim to fame was what Clemmer (1987) described as "a more dynamic water valve, one that forced water into the carbide chamber through a positive pressure device". Somehow this was accomplished by a plunger that operates through the valve stem, but I still don't know what the plunger was supposed to do, or how it was supposed to do it! 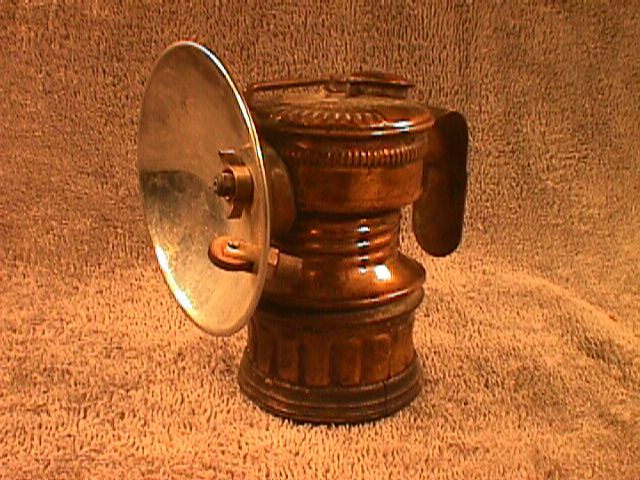 Another unusual feature of this lamp is its lighter, which, instead of sitting above the plane of the reflector as in most lamps, is largely mounted behind the reflector, with only a small portion of the rim of the sparker wheel protruding through a slot in the unplated brass reflector. 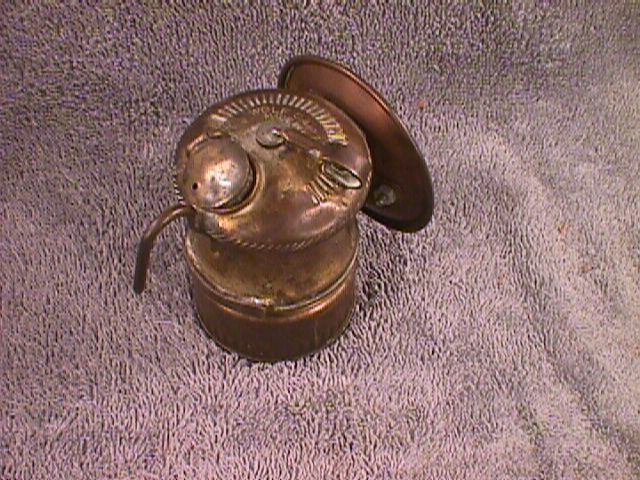 FORCE FEED CAP LAMP, from side. FORCE FEED CAP LAMP, from above. GM-1: GEM CAP LAMP: [NLA] The Gem Manufacturing Co. took over the facilities of the Grier Bros. Co. in 1924, and by 1925 was producing carbide lamps with the name "Gem". Evidently production was low or years of production few, for Gem lamps are one of the scarcer brand names today. 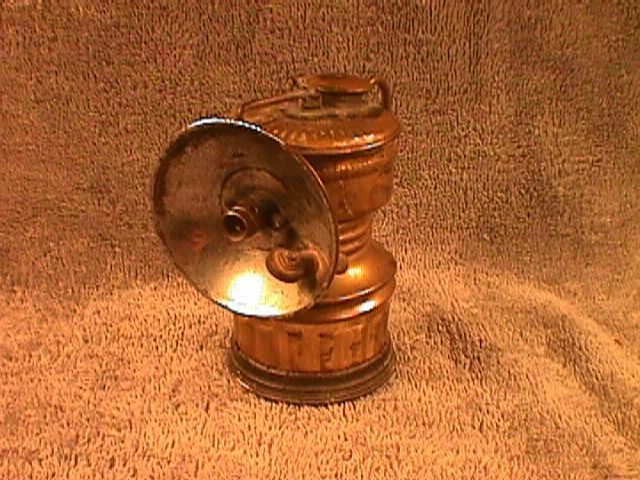 This all-brass cap lamp stands 3 5/8" high, and bears a 2 1/2" reflector of unplated brass, held on by a brass hex nut. This lamp is missing its wire sidebraces (clip-ins, a la Guys Dropper, and therefore easy to lose or break off); the screw cap and lighter spring are missing; the water door has gotten mashed, but still functions. Lamp is in better shape than the photos suggest, for I have allowed a bit of light corrosion develop on it just sitting in a display case; will clean up nicely. GEM CAP LAMP, left side. GEM CAP LAMP from above. 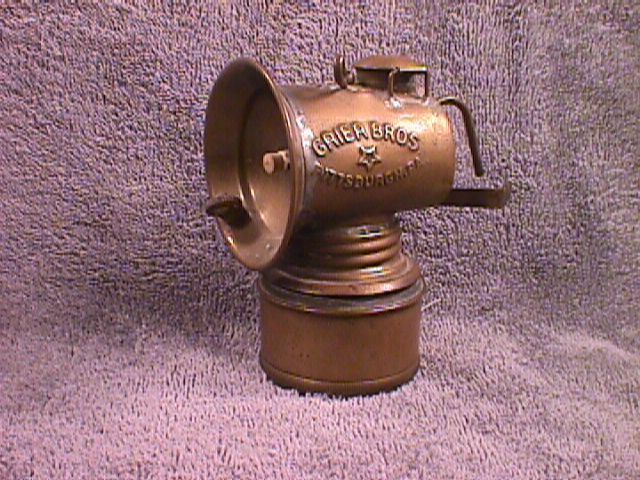 GB-1: GRIER BROS. CAP LAMP, UNFIRED: [NLA] Horizontal water tank model, with built-in 2 1/2" unplated relector with original unjacketed lava burner tip. 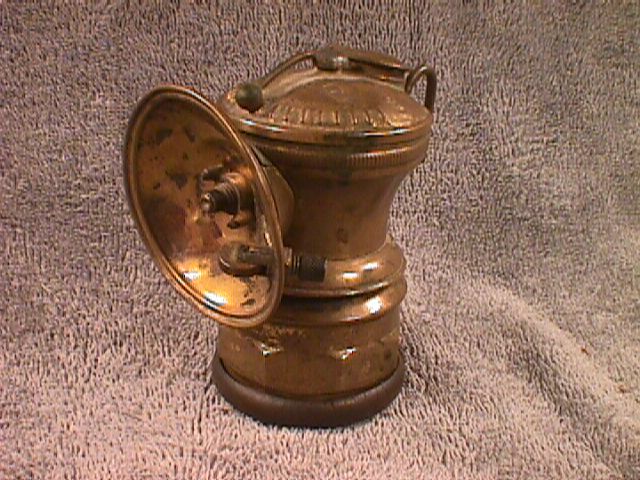 Lamp is 4" tall to top of water valve control knob. Hook and flat side clips intact. Complete and in near perfect condition (just a few minor dings on water tank), but with the sloppy soldering that seems to have been common on Grier lamps. Lamp history: This lamp has the same history as the unfired Baldwin pinchwaist described above (lamp no. BW-1). 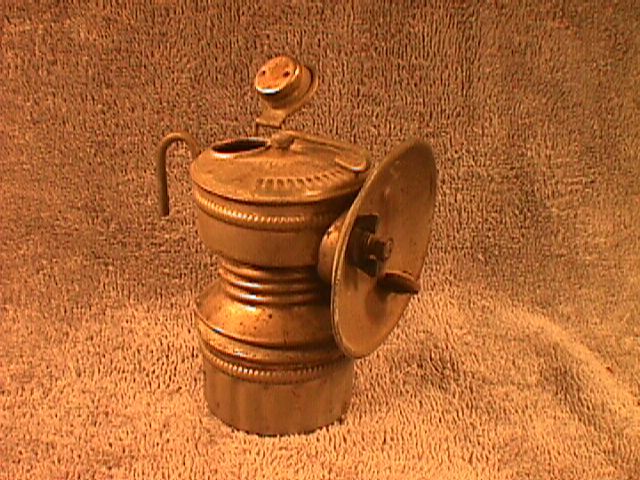 GRIER BROS CAP LAMP, side view. 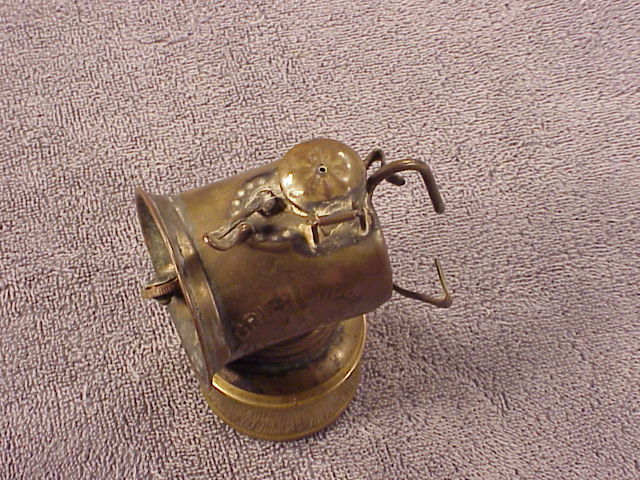 GRIER BROS CAP LAMP, top view. GB-2: GRIER BROS CAP LAMP with SELF REAMER: [NLA] Nickel plated vertical style Grier Bros. cap lamp with push-button self reamer and clip-on 3" plated reflector. 4" tall to top of water door. 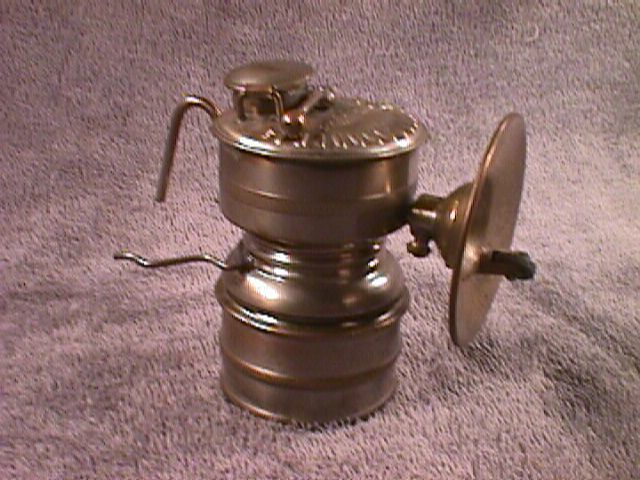 The self reamer makes this a very desireable lamp, but the lamp is not without some flaws: the tip of the self reamer wire is broken off so that it no longer reaches the burner tip to actually do the job it was intended to (however, the spring-loaded button functions just fine); the mounting hook is missing; felt plate and holder are missing; bottom has a number of vertical stress cracks. Still a nice item. Comes with a spare bottom with screw cap. 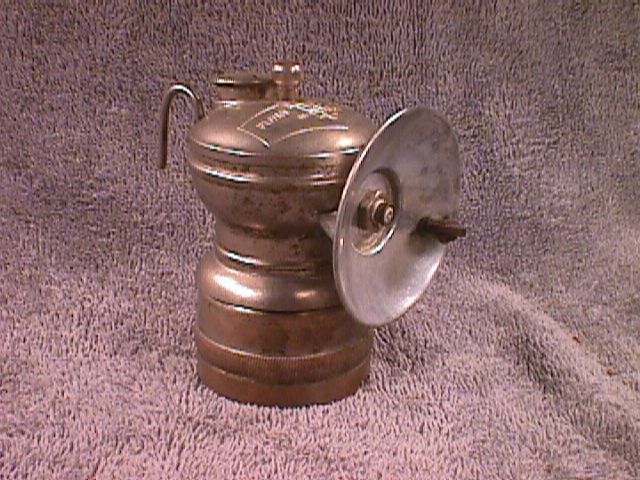 GRIER BROS CAP LAMP with self-reamer, backside. 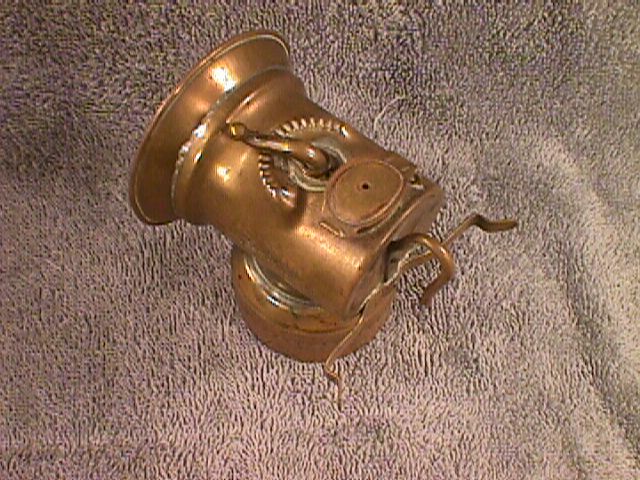 GRIER BROS CAP LAMP with self-reamer, top view. GB-3: GRIER BROS CAP LAMP: [NLA] This horizontal tank Grier cap lamp has a somewhat funky water valve control lever that consists of a brass wire bent into a form that leaves one end of the wire pointing vertically downward, where it engages in a series of round indentations to set the water valve lever position. The bottom, which bears a 1921 patent date, is not original with this lamp, but is a Grier bottom and fits the lamp perfectly. GD-1: GUY'S DROPPER CAP LAMP, 2-DATE, ROUND BOTTOM: [NLA] An early model Guy's Dropper cap lamp, probably produced in the 1916-1921 epoch (refer to Dave Thorpe's excellent history of the Guy's Dropper lamps, Eureka, Issue No. 9). Has a 3" diameter plated reflector (striker unit missing), held on with a hex nut, rather than the later wing nut. Burner tip, which is broken, is an unjacketed lava tip. Wire side braces are intact and in good condition. Base has a number of dings, all minor, and the water tank has several stress cracks, but they are tight, not gaping, with the exception of one in the skirt that the base screws into-- it opens if the base is screwed in tightly. Note: Base is stamped "Made in U.S.A. Patented" like an early Auto-Lite base. But the patina strongly suggests that it has been with this lamp a long time, if not from the beginning. What about that, Dave, did any authentic Shanklin bottoms bear this stamping? GUY'S DROPPER CAP LAMP, 2-DATE,ROUND BOTTOM. GD-2: GUY'S DROPPER CAP LAMP, HEX-BOTTOM: [NLA] This nickel-plated "2-date" Guy's Dropper cap lamp is in excellent condition, though hardly perfect. The wire clips are missing, as is the felt holder (and maybe the felt plate-- I haven't taken out the fragile felt to see). But the nickel plating is still very good, and dings are very minor. Sports a 2 1/4" plated reflector, held in place by Shanklin's distinctive flat wing nut with the big up-turned flanges. The Dropper mechanism is the early round type with a single knurled band around it. The hexagonal base is of the improved type with the inward curve at the bottom. See Dave Thorpe's fine article on Guy's Dropper history in Eureka, Issue No. 9 for more on the significance of these details. GUY'S DROPPER CAP LAMP, HEX-BOTTOM. GD-3: GUY'S DROPPER CAP LAMP, SET-SCREW REFLECTOR: [NLA] This "2-date" Guy's Dropper is in really nice shape, almost nothing in the way of dings, and it has developed a nice patina of age. Reflector is 2 1/4" in diameter, unplated. Lamp is missing the felt plate and holder, but the presence of the perforated end cap on the Dropper mechanism more than makes up for this. It lacks side clips, but that is original and correct for set-screw reflector models, as documented by Thorpe in his fine history of the Guy's Droppers lamps (Eureka, issue no. 9). The unjacketed lava burner tip is a replacement. GUY'S DROPPER CAP LAMP, SET-SCREW REFLECTOR. 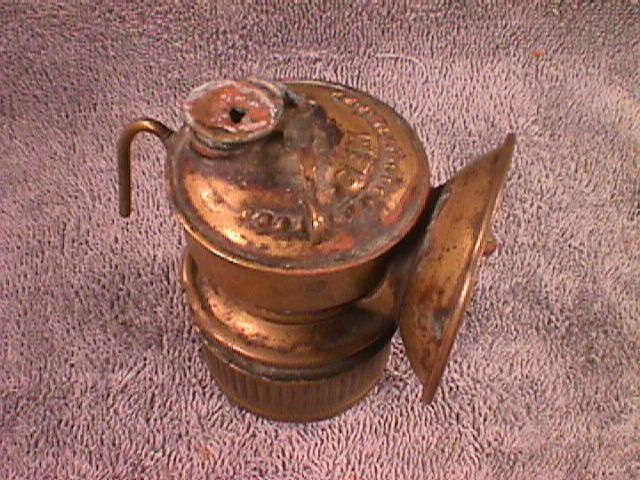 GUY'S DROPPER CAP LAMP, SET-SCREW REFLECTOR, left side. GD-4: GUY'S DROPPER CAP LAMP, 6-DATE, with "BACKWARDS" WATER DOOR: [NLA] This 6-date Guy's Dropper cap lamp by Shanklin has the water door hinged on the opposite side from the normal placement, which makes it a bit odd, though hardly rare-- many have been found. Burner tip is the old style big jacketed tip that pulls out when the wingnut is unscrewed. Some stress cracks in the water tank; missing the wire clip-in style side braces, and the 2 5/8" plated reflector has taken a couple of good hits. Not a museum piece, but an interesting old Dropper. GUY'S DROPPER CAP LAMP with "BACKWARDS" WATER DOOR. GD-5: GUY'S DROPPER CAP LAMP, 6-DATE, NICKEL PLATED, with "BACKWARDS" WATER DOOR: [NLA] Another 6-date Guy's Dropper cap lamp by Shanklin with the backwards mounted water door. But this one is nickel plated, and is in very excellent shape: no dings, just one stress crack in the skirt, and the plating in excellent shape. The reflector is a 2 5/8" diameter plated reflector, held on by the old-style flat wing nut, has been hit at sometime, hard enough to leave a ring in it from the reflector brace; the clip-in style wire side braces are missing, as usual. All in all, a very nice lamp. 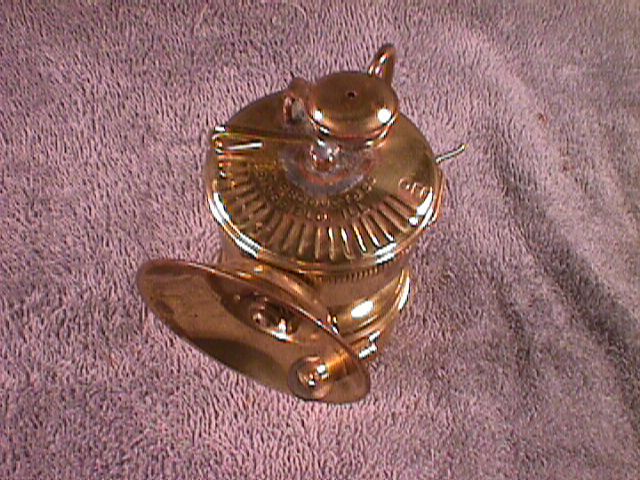 GUY'S DROPPER CAP LAMP, 6-DATE, NICKEL PLATED, with "BACKWARDS" WATER DOOR. GD-6: GUY'S DROPPER CAP LAMP, 6-DATE: [NLA] Nothing special, just a pretty good old pre-1932 Shanklin Guy's Dropper cap lamp. Has the corrugated bottom with one row of knurling or reeding above the corrugations. Reflector, 2 1/2" plated, with a ring around the rim, looks like a Universal Lamp Co. product, and if so, is a replacement. Reflector is held on with Shanklin's old-style flat wing nut. GUY'S DROPPER CAP LAMP, 6-DATE. GD-7: GUY'S DROPPER CAP LAMP, 6-DATE, NICKEL PLATED: [NLA] This nickel plated Guy's Dropper cap lamp has seen some hard usage. Much of the plating is worn off, especially on the base. The reflector, 2 3/4", plated, is pretty beat up. There is one major stress crack split in the apron below the water tank. Wire side clips were of the separate piece, clip-in style, and are missing. Base is of the ribbed type with the single band of knurling along the bottom, and bears the Shanklin stamp. I would have thought this was a post-1932 lamp and that it originally bore Universal's "Bumpergrip" in the groove between the ribs and the knurling, but Thorpe's history of the design changes (Eureka, Issue No. 9) indicates that this design pre-dates the take over of Shanklin by Universal. So why the groove? Go figure. GUY'S DROPPER CAP LAMP, 6-DATE, NICKEL PLATED. 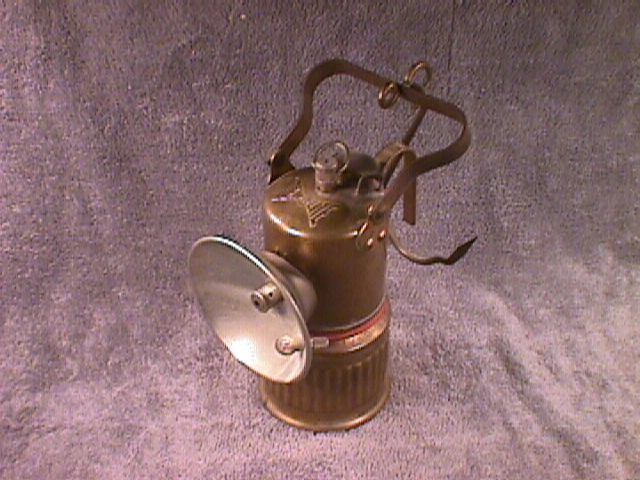 GD-8: GUY'S DROPPER CAP LAMP, 6-DATE: [NLA] Complete, right on down to the wire side clips, and completely original. Reflector is 2 1/4" diameter, plated, with flat center. Base bears the Shanklin Mfg. 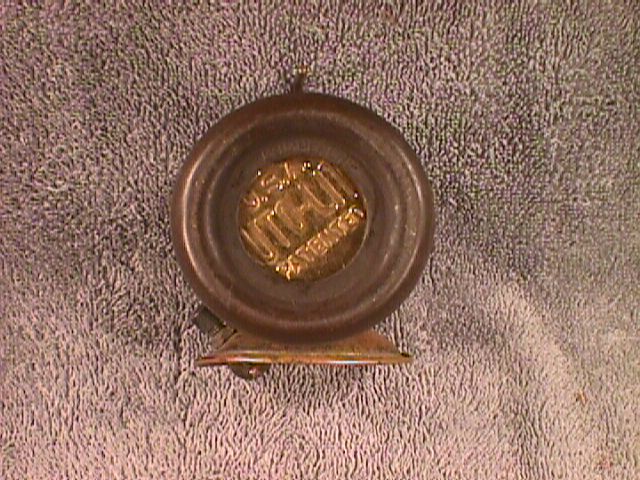 Co. stamping, but the "Bumpergrip" tells us this is a post-1932 lamp with the Universal Lamp Co. in control. Lamp is in very nice shape, with perhaps 40-50% of the original finish intact. GD-9: GUY'S DROPPER CAP LAMP, 6-DATE, SPADE MOUNT: [NLA] This lamp is 100% complete, and completely original. Only flaw is that most of the original finish is gone. The 2 1/4" plated reflector is in excellent shape. There are no stress cracks. The spade mount is of the short variety. I may need to keep this one for caving-- we'll see if someone else wants it. GUY'S DROPPER CAP LAMP, 6-DATE, SPADE MOUNT. 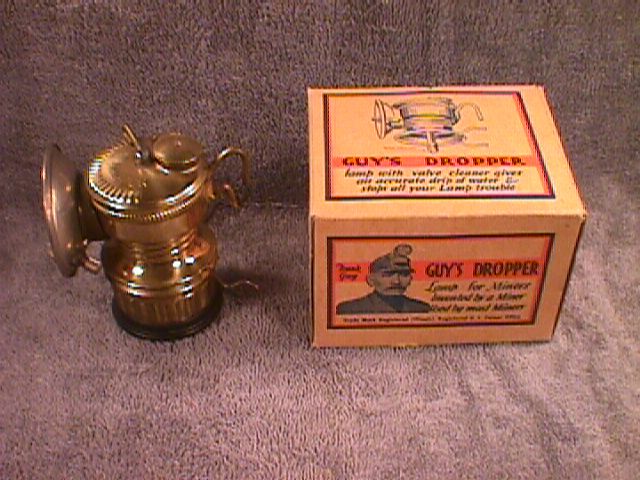 GD-10: GUY'S DROPPER CAP LAMP, DOUBLE HOOK MODEL, UNFIRED, with ORIGINAL BOX: [NLA] Hoo-boy! Unfired, perfect as they come, complete with box in excellentisimo condition, and a hard-to-find double hook model at that. Need I say more? Well, OK, just a little: 2 3/8" plated reflector with ring around the rim; clip-in wire sidebraces; scarcely any age flaws in the lacquered finish; absolutely 100% complete and 100% original. Box has two small holes of uncertain origin, and one small ink-marked area where a price may have been marked out. UNFIRED DOUBLE HOOK GUY'S DROPPER CAP LAMP, side view. UNFIRED DOUBLE HOOK GUY'S DROPPER CAP LAMP, showing double hook mount. GD-11: GUY'S DROPPER CAP LAMP with SPECIAL WIND-PROOF TIP: Don't know if this burner tip is a Universal Lamp Co. product or not. I suspect not, but in any case these special wind-proof tips were cherished by some of the Cumberland Plateau coal miners, and are a scarce item today. Lamp is missing the wire clip-in style side braces, but is otherwise in excellent shape: no dings or stress cracks. GUY'S DROPPER CAP LAMP with WIND PROOF TIP. GD-12: GUY'S DROPPER CAP LAMP with CANVAS CAP: [NLA] A standard, recent model Guy's Dropper lamp by the Universal Lamp Co., in excellent condition: no dings, no stress cracks, and much of the original finish intact. The original wire clip-style side braces have been lost and replaced by a very neatly made homemade set that work as well as the originals. 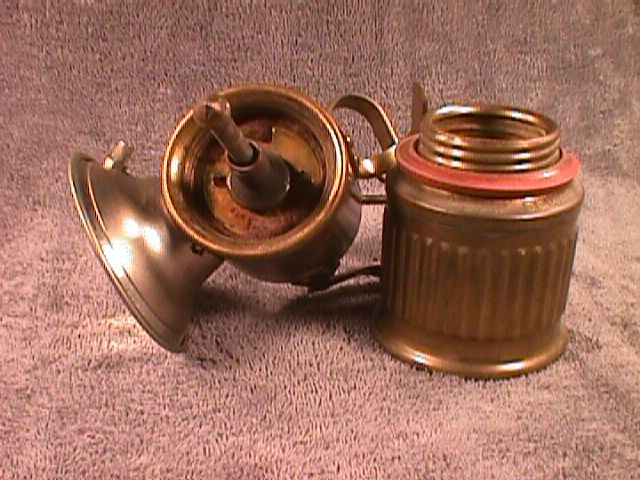 Burner tip is a vented lava tip that is probably older than the lamp itself, but one that is superior in its wind resistance to the brass jacketed tip that was original. 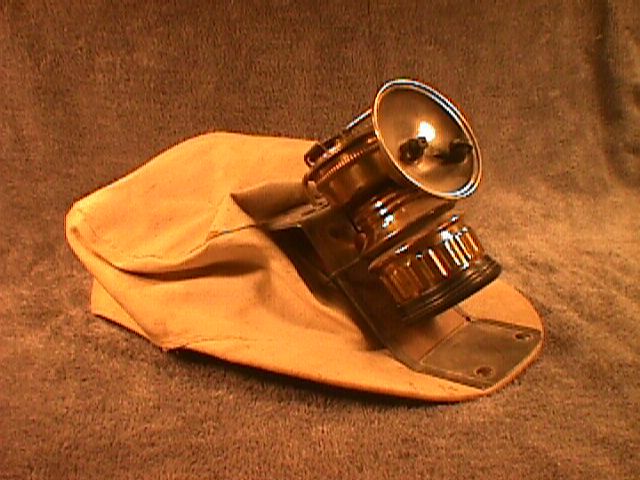 This lamp comes mounted on a white canvas cap with a "Double Safety" lamp mount on front. Altogether a very nice ensemble. 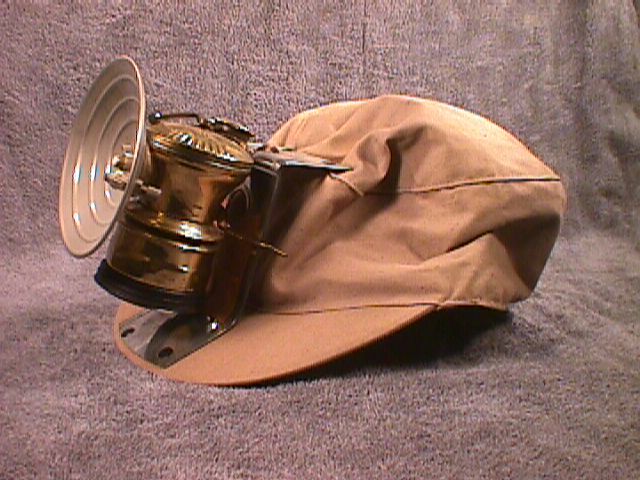 GUY'S DROPPER CAP LAMP with CANVAS CAP. GD-13: GUY'S DROPPER, CAP LAMP, SPADE MOUNT: A standard, recent model Guy's Dropper lamp by the Universal Lamp Co., with the typical long wide spade. 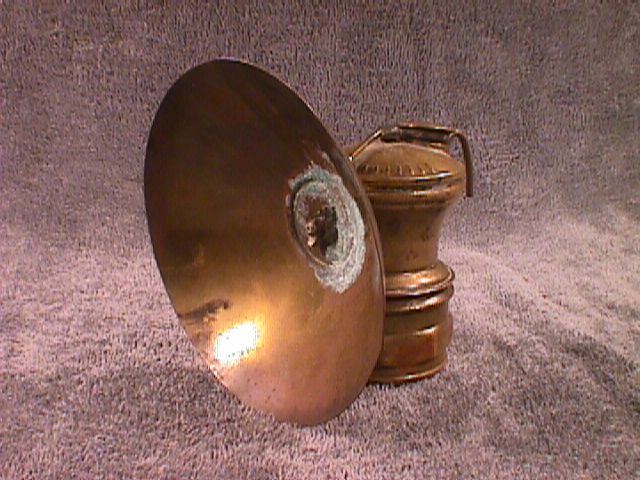 Three-inch plated reflector in excellent shape. Lamp is complete and completely original as far as I can tell. Has seen a lot of use, but by a careful coal miner on the Cumberland Plateau of Tennessee who, when he knocked the spent carbide out of the carbide chamber, nicely distributed the consequent denting evenly all around the sides of the carbide chamber. Gives the lamp base a just slightly caved-in look that is one of the lamp's attractive characteristics. GUY'S DROPPER CAP LAMP, SPADE MOUNT. GD-14: GUY'S DROPPER "TALL BOY" HAND LAMP: [NLA] A very excellent condition hand lamp, 100% complete, and completely original (with the exception of a homemade rubber gasket added beneath the factory gasket for some reason). No dings, no stress cracks, no flaws at all in the lamp body that I see. Lamp has the big 7" reflector, and its plating is nearly perfect, but it has caught a couple of dings. 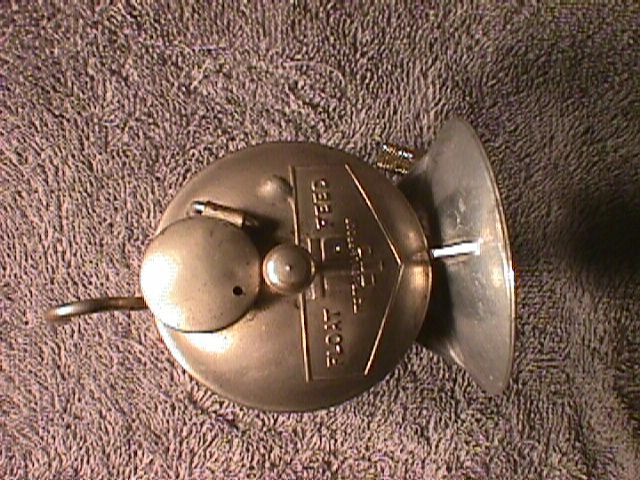 Burner tip is shielded with a flame protector. Lamp stands 5" tall to the top of the water door, and of course, features an extra tall water chamber and carbide base. A very fine example of this model. GUY'S DROPPER "TALL BOY" HAND LAMP. 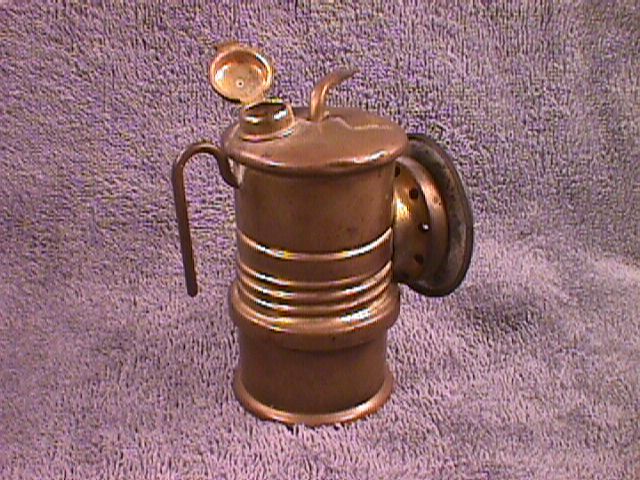 GUY'S DROPPER "TALL BOY" HAND LAMP, another view. Historical aside: Where did the name "Tall Boy", commonly used by collectors to designate this lamp, come from? As far as I know it is not in any of the advertizing literature, and is not an official Shanklin or Universal designation. Shanklin consistently referred to the lamps as Superintendent's lamps. Well, I might be wrong, but I think I know the origin: me! I believe I nicknamed this lamp the "Tall Boy" when corresponding with Henry Pohs about it some time around 1966 or 67. He picked the name up, and from him, other collectors. Well, I can't be sure, after all these years, that this is how it happened, but I think so. If anyone who reads this knows differently, please let me know. I am curious! GD-15: GUY'S DROPPER 8-HOUR HANGING LAMP: [NLA] While Guy's Dropper cap lamps abound, and "Tall Boy" hand lamps are not rare, a Guy's Dropper 8-hour or full shift lamp is a rarety in my experience. I only know of two models, the "straight waist" model, which is probably the earlier of the two, and the "pinch waist" model, which is probably the later (see Pohs' big book, pg. 480). The lamp described here belongs to the first category. It is a nickel-plated, steel lamp with hook and bail for hanging, and handle on the backside for carrying. The top carries six patent dates, so I guess we could call this a "6-date Dropper". The reflector is slightly over 3" in diameter, of deep dish design, originally plated, and held to the reflector brace by the old style Shanklin flat wing nut and a pair of striker units ("dual ignition"!). The major flaw with this lamp is that the carbide bottom appears to be an Acme or Justrite bottom. Nonetheless, it has been with this lamp a long time, and indeed, this lamp was in use with this bottom when I acquired it in 1965. This lamp performed many an hour of faithful service in hardrock mines before being retired to my collection. 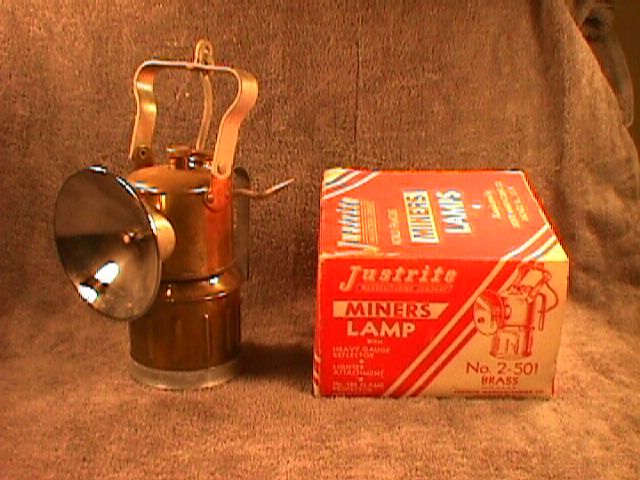 Lamp history: This lamp was being used in 1965 by John Lambertson in the Star Mine and Independent Mine, both of which he held claims on. The mines are located in a cirque below the peak of North Italian Mtn., Colorado. Lambertson was a Swedish-American miner of the type mine artifact collectors have all read about and admired: hearty, independent, stubborn, and always in hopes of striking it rich. He had worked here as a teenager, then moved on. When the Depression struck he drifted around, but ultimately came back to Italian Mtn. and began working abandoned claims. He was 75 when I met him in '65 and still going underground daily. He was developing his mine he said, in hopes of selling out to a "big company". He lived, with his invalid wife, in a mine camp building he had rehabilitated; they had no electric power and were 50 miles from the nearest town of any size; about once a month John would carry his wife out to his 4WD pick-up and they'd drive into Gunnison for supplies; until late in his life the two of them continued to live here even through the winters at 11,500 ft above sea level! I doff my hardhat to John Lambertson-- 'twas your type that made America strong in the first half of the 20th century. GUY'S DROPPER 8-HOUR HANGING LAMP. HN-1: HANSEN CARBIDE CAP LAMP: [NLA] In my opinion, this is the most beautiful of all carbide lamps. And in addition to its esthetic design, it is one of the best constructed of all lamps, being fabricated of what feels like stouter gauge materials than many contemporary lamps, and reinforced in many ways to make what must have been a highly durable lamp. The Hansen stands 3 5/8" tall, and carries a 2 1/2" unplated brass reflector held by a stout steel support that clasps it in an embrace that protects it from both forward and backward striking blows. The reflector brace also supports the spring-loaded "Snap Lite" self-striker that ignites the gas jetting from the unique Hansen burner tip which screws into (not over) the gas tube. 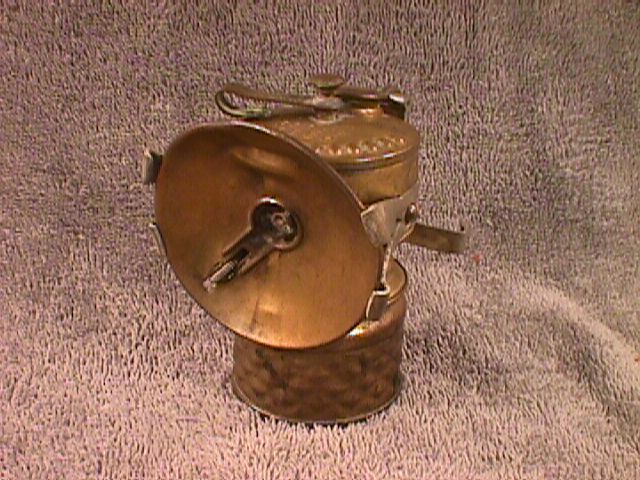 The water door is hinged differently from other carbide lamps, flopping straight back toward the mounting hook on a horizontal hinge pin that is held in an extension of the steel reflector brace. But the crowning glory of this lamp is its lovely "quilted" carbide base, which, aside from giving a good grip, is truly a thing of beauty. This particular lamp has been fired, maybe used some, but is in near-perfect condition. It's sole flaw is that the side clips have been broken off; the replacement clips are interesting in their own right: a very neatly done job, expertly manufactured by none other than the Dean of American Carbide Lamp Collectors, Henry A. Pohs. 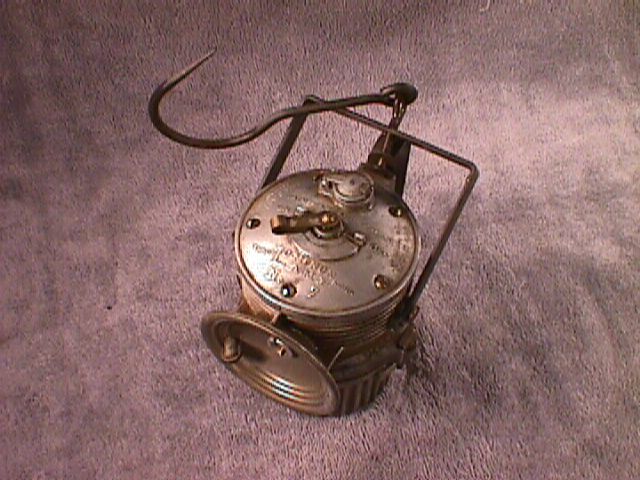 HANSEN CAP LAMP, left side. 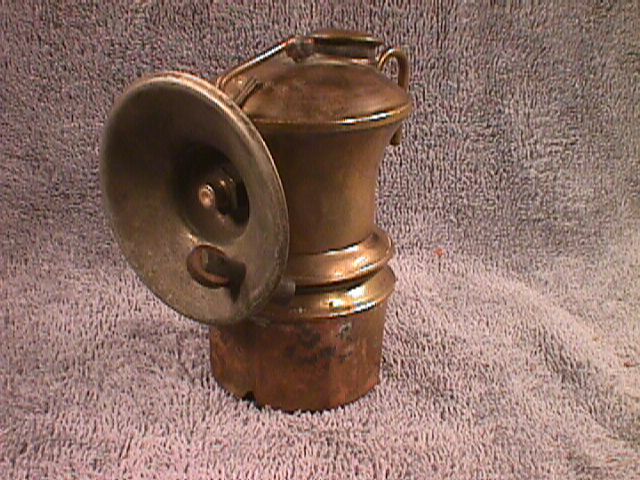 HANSEN CAP LAMP, right side. 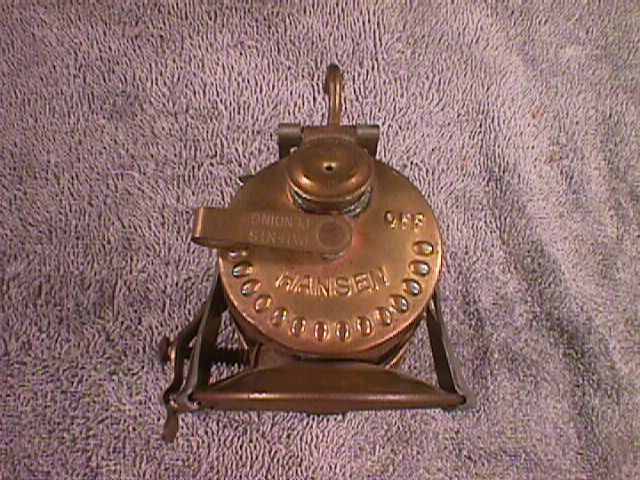 HANSEN CAP LAMP, top view. 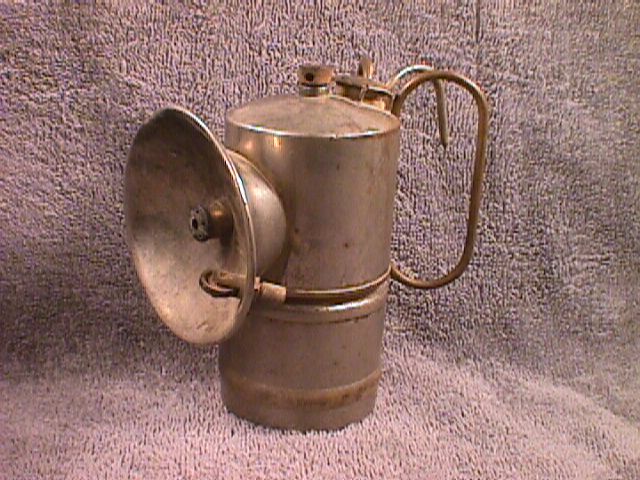 IT-1: ITP SUPERINTENDENT'S LAMP: [NLA] Nickel plated ITP ("It's Trouble Proof") hand lamp or "superintendent's lamp" with hook and folding handles; manufactured by Dewar. 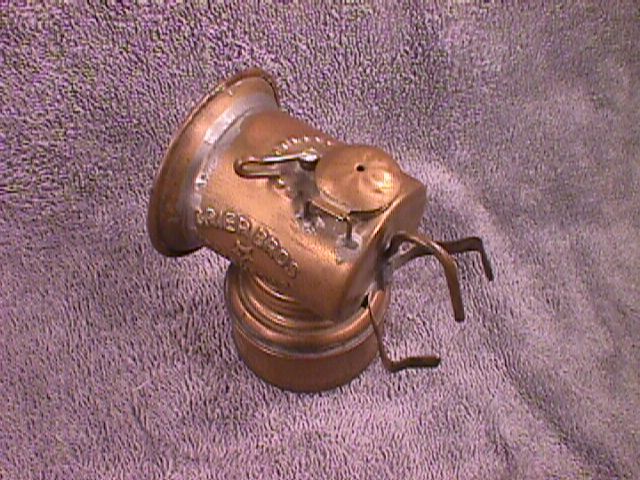 5 1/8" tall to top of water valve control knob, with 3" plated reflector sporting Dewar's famous screw-on vented flame protector. Complete except for the ring that ought to be in the water valve control knob; one pretty good sized ding in the side of the base, and some minor ones in the bottom of the base. Moderate amount of plating worn off. Definitely been used, but very probably still functional. ITP HAND LAMP, side view. 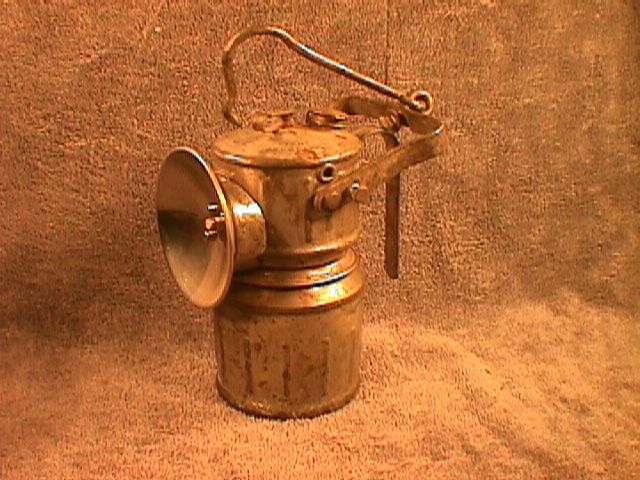 IT-2: ITP HAND LAMP, UNFIRED: [NLA] A lightly tinned steel hook and bail lamp; looks to be identical to that pictured on Poh's book pg. 515. 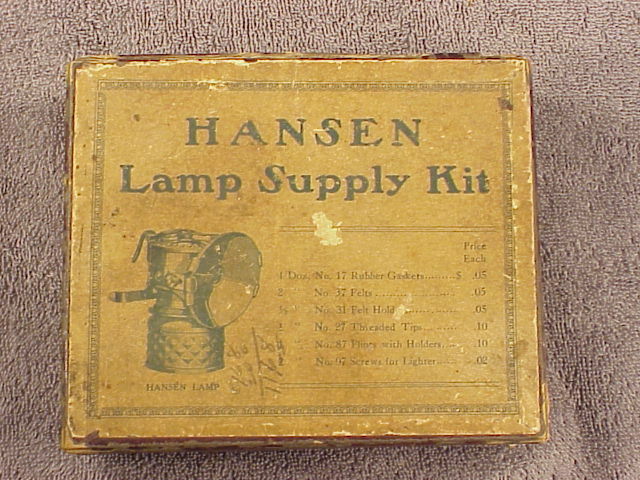 This lamp is unfired, complete, including original the box (unmarked brown cardboard). Except for the disappearance of some of the thin plating, presumeably an effect of aging, this lamp is perfect. 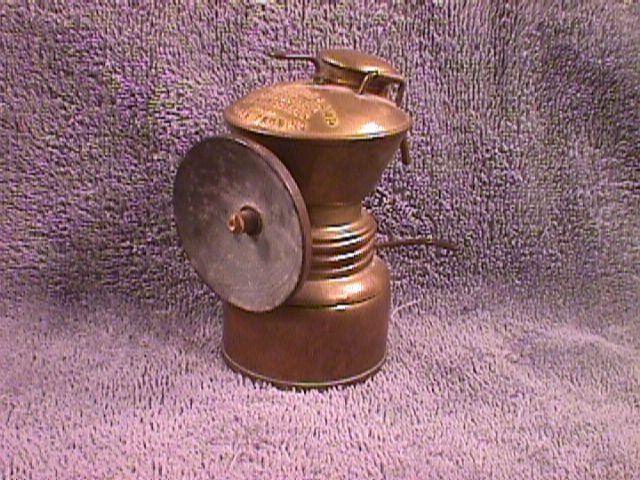 Especially attractive features: 1) rectangular brass plaque on one side giving the name "ITP Carbide Mine Lamp" and the maker "DEWAR MFG. CO.", patent dates, etc. 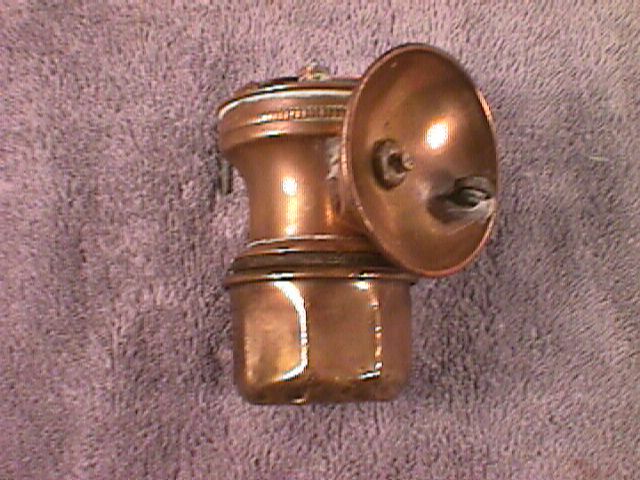 ; 2) Dewar's vented screw-on flame protector; 3) stylish flared metal reflector brace; 4) brass water door and valve stem. 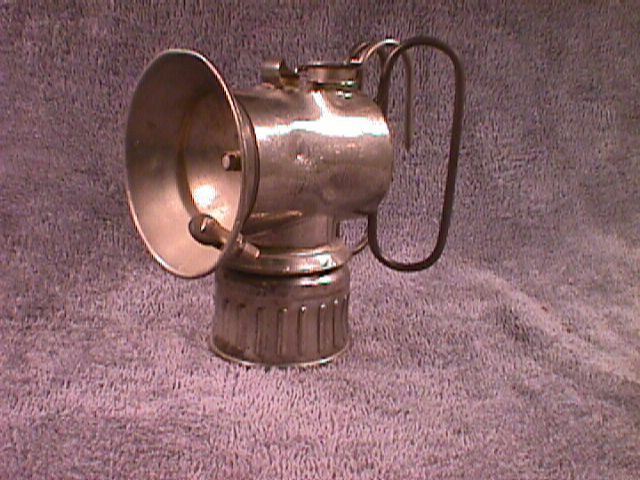 IT-3: ITP "FLOAT-FEED" CAP LAMP: [NLA] A nickel plated ITP ("It's Trouble Proof") cap lamp by the Dewar Mfg. Co., complete and in excellent condition. Has the 2 3/8" diameter cast aluminum reflector (in perfect condition), held to the lamp with a hex nut, and equipped with a lighter. Burner tip is correct ITP tip, presumably the original. Water tank has a few tiny dings, and a spot of excess solder that shows in the second photo. The base has a few small dings and the nickel plating on the base shows a good deal of wear, but overall this is an excellent condition lamp. You could probably charge it up and go right in on a shift (except for the fact that you'd get thrown out of most mines, if not arrested, for an open flame lamp today!). ITP CAP LAMP, SIDE VIEW. ITP CAP LAMP, VIEWED FROM ABOVE. JR-1: JUSTRITE SUPERINTENDENT'S LAMP: [NLA] Nickel plated, horizontal style superintendent's lamp with 2 1/2" built in reflector with lighter. Lamp features the early style "curl-back" water control lever, oval water door, and beaded bottom. Lamp stands 3 3/4" tall to the top of the water door, and, of course, folding handles in addition to the normal mounting hook. I estimate this lamp to have been produced between 1914 and 1919. The beaded bases do not show in Justrite's catalog No. 1 (1913), but do show in advertising in 1915; the "curl-back" water control lever has disappeared by the time of the issuance of Catalog No. 3 in 1919. This example has quite a few dings, but is complete and a good piece. JUSTRITE SUPERINTENDENT'S LAMP, nickel plated, beaded base. JR-2: JUSTRITE SPIRAL FEED CAP LAMP: [NLA] A brass, horizontal style, beaded bottom Justrite cap lamp, with 2 1/2" built-in reflector, oval water door, and featuring one of Justrite's more novel ideas, the "Spiral Feed" water control. 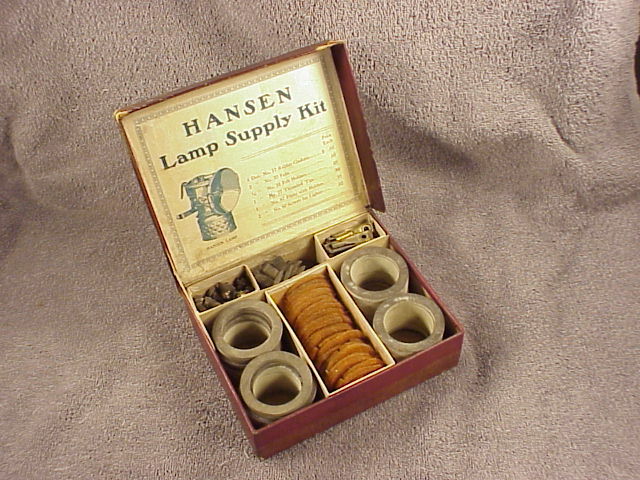 The "Spiral Feed" was patented Oct. 24, 1916 and assigned to Justrite by Augie L. Hansen (who later created his own famous lamps). The idea behind the spiral feed was that no matter which way one tilted the lamp there would always be some water pulled by gravity down the corkscrew water path. Looks like an invitation to clogging to me, but the feed had some degree of popularity in its day. This lamp is complete; all original as far as I know, including the unjacketed lava tip, but the felt holder might be a replacement; clean and in excellent condition with only very minor dings. Really nice lamp! 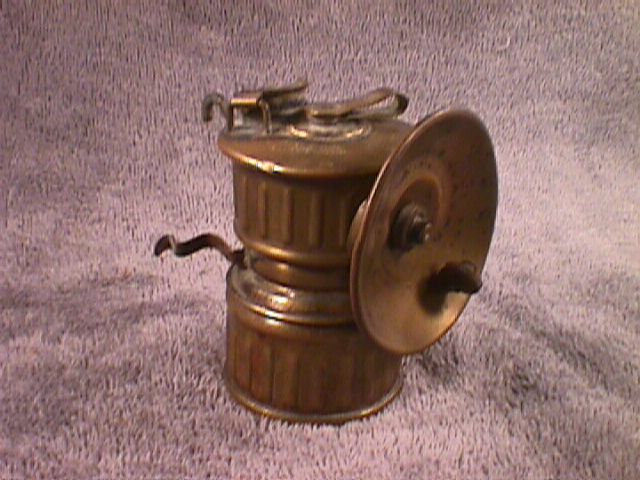 JUSTRITE SPIRAL FEED CAP LAMP, side view. 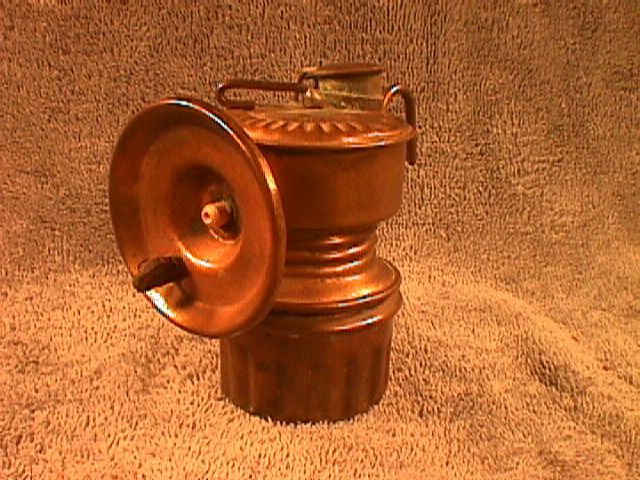 JUSTRITE SPIRAL FEED CAP LAMP, top view. 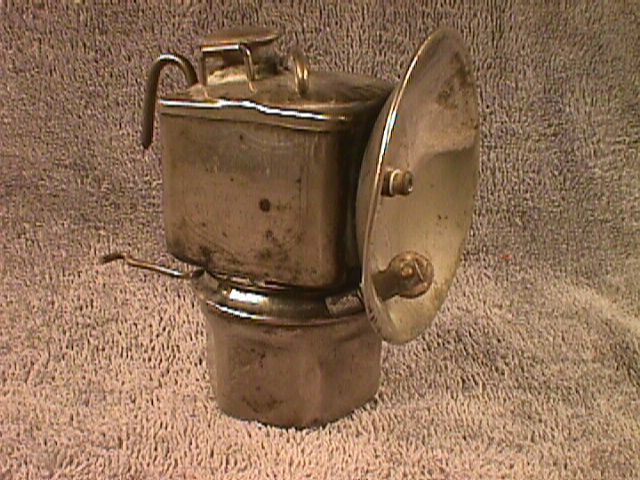 JR-3: JUSTRITE SUPERINTENDENT'S LAMP: [NLA] Nickel-plated, horizontal water tank superintendent's lamp with 3" diameter built-in reflector, hook and folding handles, round water door, and "wire feed" valve stem. Lamp stands 4 1/4" tall to top of water door, but the short (regular size) carbide base may not be original with this lamp-- probably should have the taller size base. Justrite's Catalog No. 5 (1921? ), and Catalogs Nos. 6 and 7 all show Superintendent's lamp No. 95, which looks like this lamp with a taller base. A Justrite lamp, evidently No. 95, shows in the 1929 Mine & Smelter Supply Co. catalog, but under a M&SS catalog number. The latest patent date on this lamp is Nov. 28, 1915, but the cuts in catalogs 5, 6 & 7 all show lamps with 1913 as the latest patent date. Justrite's Catalog No. 3 for 1919 does not list the "wire feed" water control, which is listed in 1921 catalogs (Pohs refers to this valve stem as the "wire feed redesign", because the earliest water feeds were a type of wire feed). 1921 catalogs also show the introduction of the ribbed carbide bases. From all the above, I conclude that this lamp is a model No. 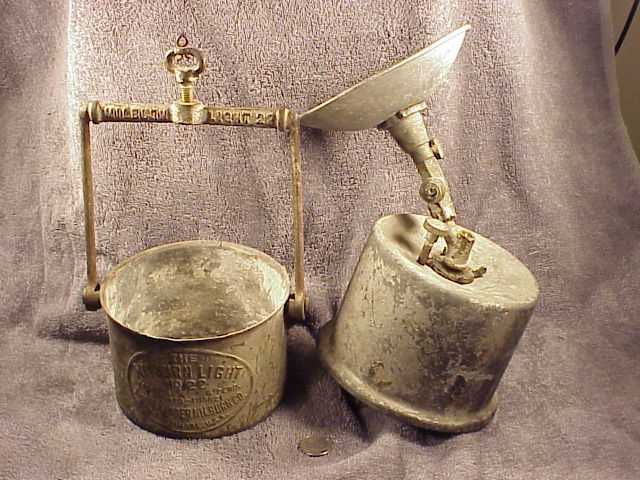 95, with a short base replacing the original base, and was likely manufactured between 1921 and 1930, probably in the late twenties. Missing felt plate and felt holder; some dings in the water tank, and base shows some effects of knocking out spent carbide. Definitely saw some use! JUSTRITE No. 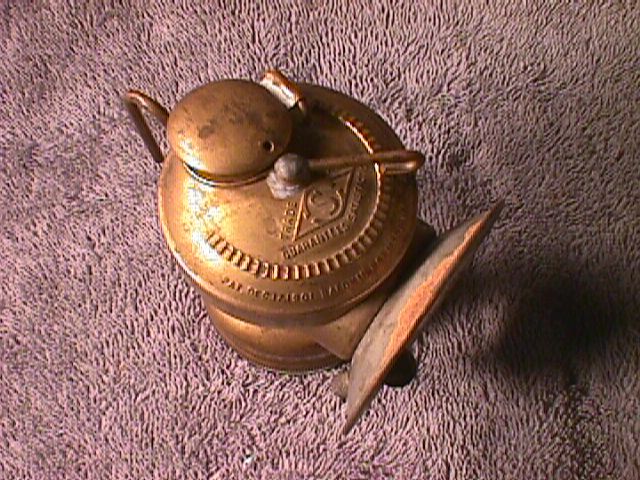 95 SUPERINTENDENT'S LAMP. JR-4: JUSTRITE VERTICAL STYLE CAP LAMP with "PROTECTO-GRIP": [NLA] Brass, "vertical style" Justrite cap lamp, listed in Justrite's Catalog No. 10 as Model No. 661. 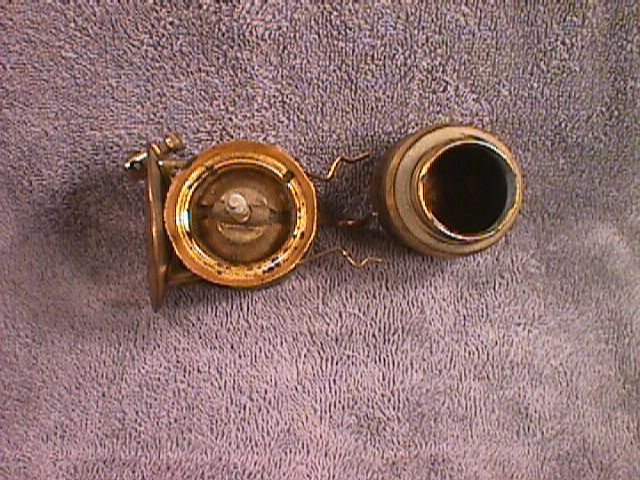 This is the later model vertical Justrite that features the water control lever with the highly distinctive ball on the end. See photo on pg. 450 of Pohs' Miner's Flame Light Book. Lamp has one good ding in the top, and reflector has undoubtedly struck the mine back a few times, but over all condition is pretty good. The main flaw is the "Protecto-Grip", which has hardened and partially chipped off. 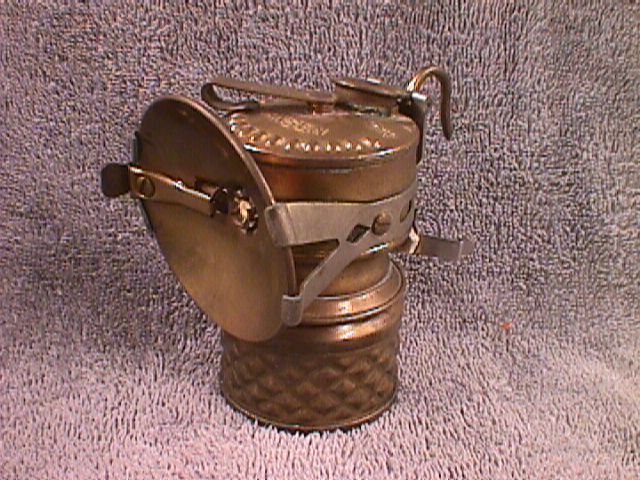 JUSTRITE VERTICAL STYLE CAP LAMP with "PROTECTO-GRIP", from the side. JUSTRITE VERTICAL STYLE CAP LAMP with "PROTECTO-GRIP", from above. 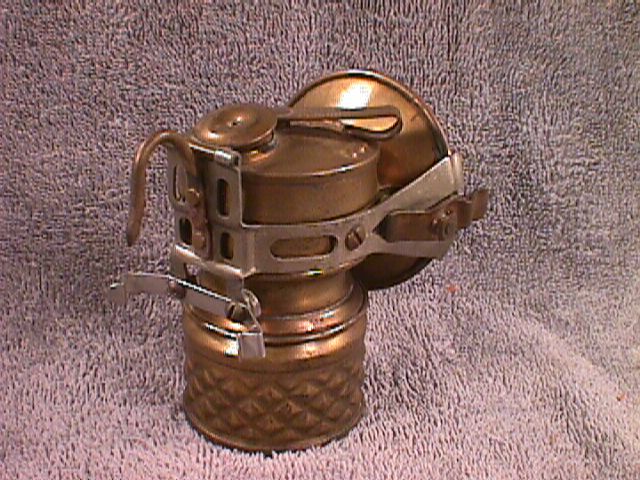 JR-5: JUSTRITE HORIZONTAL STYLE CAP LAMP: [NLA] A brass, horizontal style water tank Justrite cap lamp with a 4" diameter detachable reflector with lighter. Lamp is in good shape but is missing the wire side braces, and the base is encrusted in a red material that looks like plastic, but could be hardened rubber. I do not know if "Protecto-Grips" ever came in red and if this could possibly be the remains of one; I rather suspect it was a home-made attempt at a "Protecto-Grip". In any case, it looks like it could be fairly easily picked off the base to clean it up; I have not done this, because I believe in leaving most lamps as I acquire them, their defects being part of their history and character. Additional note: Mike Puhl has confirmed for me that "Protecto Grips" came in red! I still don't know if the melted mess on this lamp is the remains of an original "Protecto Grip" or not, but the chances are now improved! If I bought this lamp, I'd do just what I've done with it: leave the red stuff in place! JUSTRITE HORIZONTAL STYLE CAP LAMP. 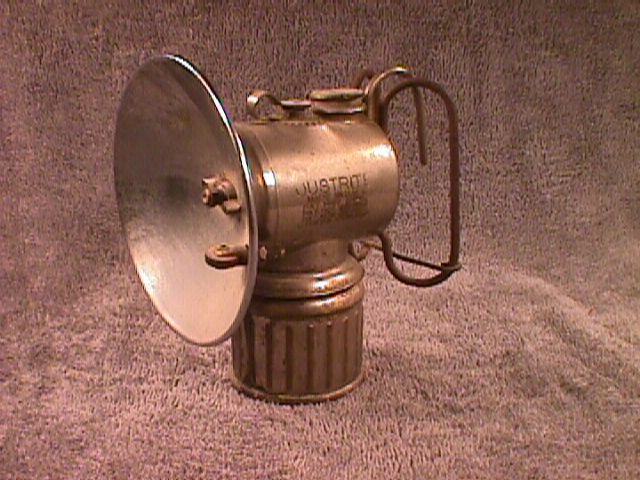 JR-6: JUSTRITE HORIZONTAL STYLE SUPERINTENDENT'S LAMP: [NLA] A nickel plated horizontal style water tank Justrite Superintendent's lamp with a detachable 4" diameter plated reflector. Folding handles are held in spread position by a wire brace that may or may not be original; I have never noted this feature in any Justrite catalog, and it could easily be a homemade adaptation; in any case, it is neatly and effectively done. Lamp is complete and in excellent shape; plating shows some wear, especially on the ribs on the base, but there are no dings worth noting. Nice piece. 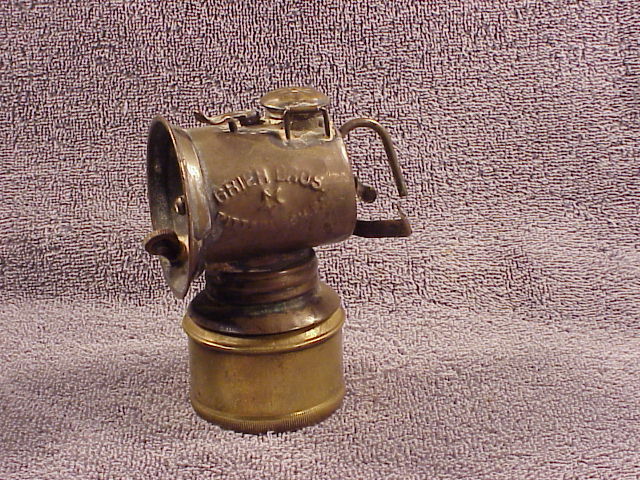 JUSTRITE HORIZONTAL STYLE SUPERINTENDENT'S LAMP. 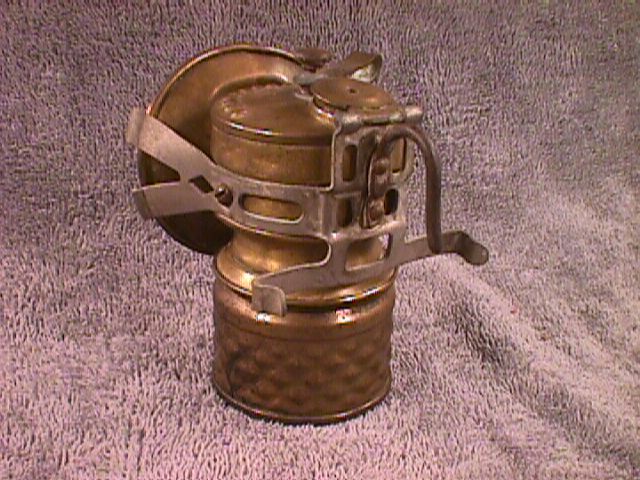 JR-7: JUSTRITE HORIZONTAL STYLE CAP LAMP with "AIR-COOLED GRIP": [NLA] Brass, horizontal water tank, with 2 1/2" detachable, unplated reflector. 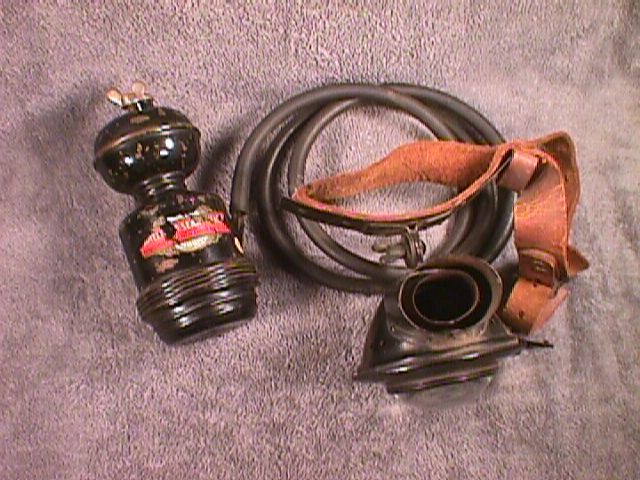 Lamp is complete and completely original; one good ding in the water tank, but over all condition is quite good: it retains much of the original finish, the side clips are intact, and the rubber in the "Air-Cooled Grip" is still pliable. Nice lamp! 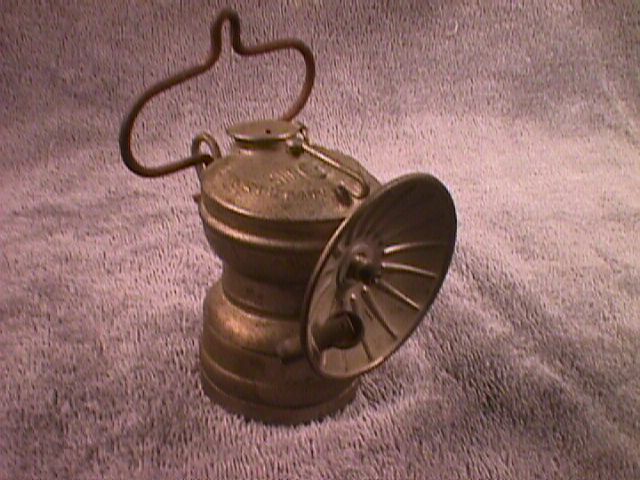 JUSTRITE CAP LAMP with "AIR-COOLED GRIP". JR-8: JUSTRITE No. 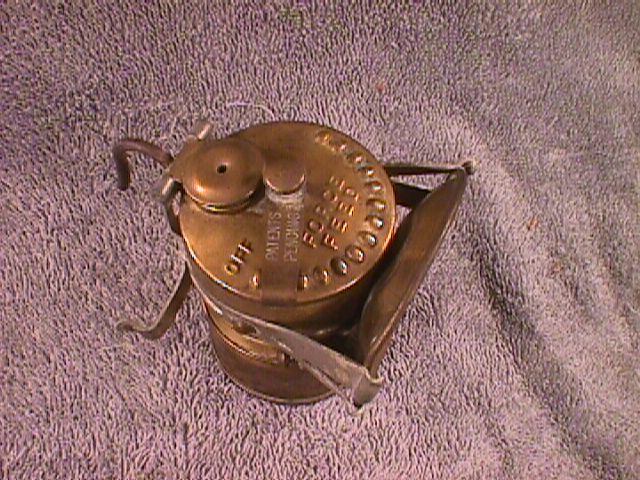 2-501, UNFIRED, with ORIGINAL BOX: [NLA] Justrite Mfg. Co.'s No. 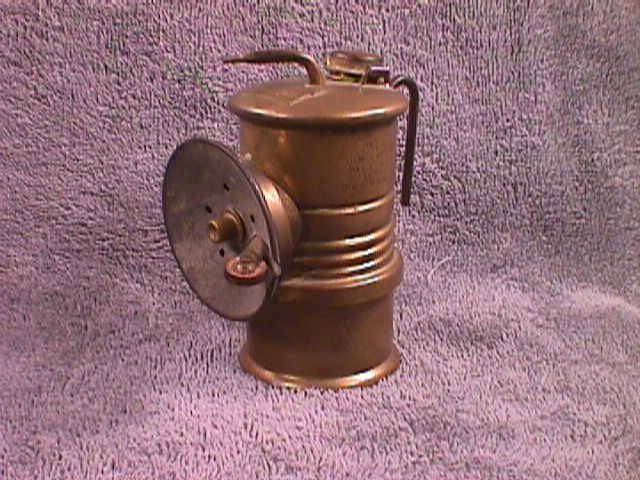 2-501 is a brass 8-hour or full shift lamp, accoutred with a hook and bail, plus vertical handle, and a 4" deep dish plated reflector. This lamp is 6 1/2" high to the top of the valve stem. It is unfired, complete, and mint. Comes with its original red and white box. Lamp history: I bought this lamp off the shelf in Casa Mormack, Tegucigalpa, Honduras, in 1974, back when I was working as an exploration geologist for the Rosario Resources Corp. (the New York & Honduras Rosario Mining Co. from 1878 until the 1970s when they began to get big-for-their-britches ideas). Had it not passed into my collection, this lamp most likely would have wound up underground in one of Honduras' silver mines. JR-9: JUSTRITE NO. 12 ACETYLENE LANTERN: [NLA] Well, I think it is a No. 12; I've never known for certain how to tell No. 10 and No. 12 apart, but in the catalog cuts the 12 looks to be slimmer and of nicer lines than the earlier 10, and mine looks like a 12 to me. Lantern is complete and in near-perfect condition, just a couple of dings in the base. Bullseye lens and glass chimney are perfect. There is one puzzlement: all the advertisements I have in my collection of literature say the lantern is nickel plated, as every other one I have seen has been. This lantern is not nickel plated, but I don't see any reason to believe it has been stripped, in fact I believe I see traces of an original lacquer finish here and there. I'll have to say I do not know if this lantern was ever nickel plated or not. Additional note: Mike Puhl has confirmed for me that this lantern is a No. 12. Additional note, Dec. 1, 1999: Lamp collector Andrew Peacock has informed me that he has a No. 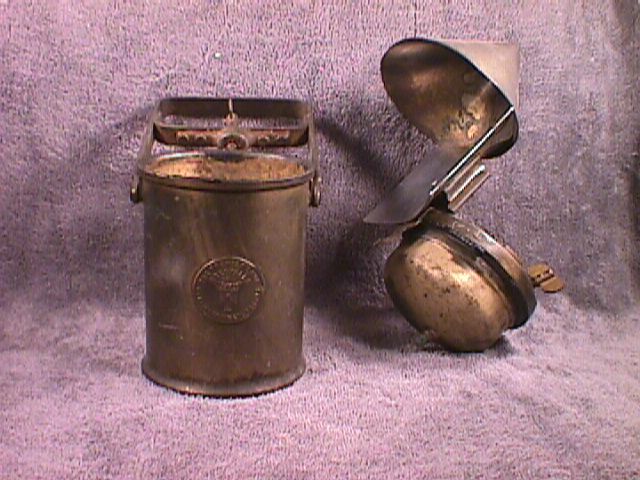 10 lantern that has seen very little wear (is in its original box) and which is of unplated brass. If the No. 10s were available unplated, the No. 12s most probably were too. Thus the lack of plating on my lamp is almost certainly the way it came from the factory. Thanks for the info, Andrew! LU-1: LU-MI-NUM CAP LAMP: [NLA] I have always thought Fred R. Belt's cap lamp to be one of the finest lamps from an engineering design standpoint. 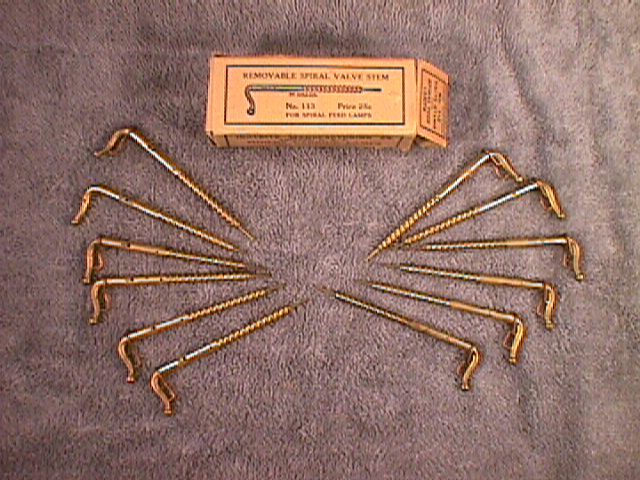 It is made of cast aluminum, so it is light weight; it is finned to dissipate heat and the fins provide excellent gripping surfaces; the carbide base is held on with lugs, so there is never any worry about threads wearing out or gumming up; if the water valve wears, it can be reset by merely loosening a screw and turning the valve stem; the gasket is built in to a groove in the carbide base so it doesn't fall off during carbide changing; and the lamp is very compact. What a list of features! But it also had its shortcomings, as I found out when I used one for caving (not the one being offered for sale here): the carbide base is too small and the small charge burns out too fast; the 2 1/4" aluminum reflector doesn't put out enough light for cave passages (probably not much of a problem in the confines of a coal mine). Anyway, this is a great lamp design and a great item for a mine lamp collector. This lamp is complete, but the striker unit is probably a replacement, maybe a Universal lamp part. Note that this lamp has not only the standard hook, but also the side brace, which is rarely seen with these lamps. Reason? Well, as far as I can figure it out, the side brace was screw-mounted mounted onto the miner's helmet, rather than being attached to the lamp. So when the lamp was hooked onto the helmet, it then snapped into place in the spring-clamp style side brace. But when the lamp was taken off the helmet, the side brace didn't come with it. Hence you rarely find one of these lamps with the side brace. And indeed, this lamp did not come with this particular brace; the brace I picked up years ago when I traded for some Lu-Mi-Num lamp parts. Lamp history: Same as GD-14, this lamp was still in use when I traded for it in 1965. It was being used by John Lambertson, a Swedish-American miner, then 75, who was still working the Independent and Star mines at North Italian Mtn., north of Crested Butte, Colorado. It was a rare privilege for me to get to know him as I worked on a geologic map of the Italian Mtn. area for my master's thesis. Lord, the mountain in those days was loaded with relics: ore carts in one drift, a miner's whim (horse-powered winch) lying beside an abandoned shaft, a horse-drawn road grader abandoned by an old road, a single cylinder gasoline winch (that Lambertson kept in tip-top shape) in the shaft house of the Star Mine, an assay lab full of stuff, a steam winch and big whistle atop the shafthouse! I'm sure its all gone now. LU-MI-NUM CAP LAMP, side view. 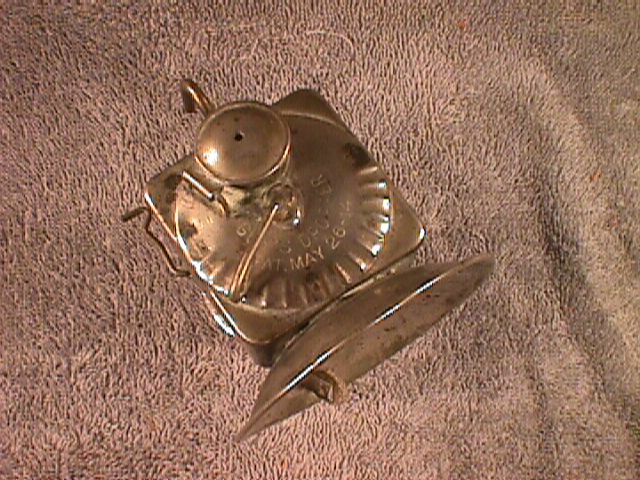 LU-MI-NUM CAP LAMP, top view. LU-2: LU-MI-NUM LAMP NO. 7: [NLA] Lu-Mi-Num Lamp four-hour hand lamp or half shift lamp manufactured by the Fred R. Belt Co. of Chicago. 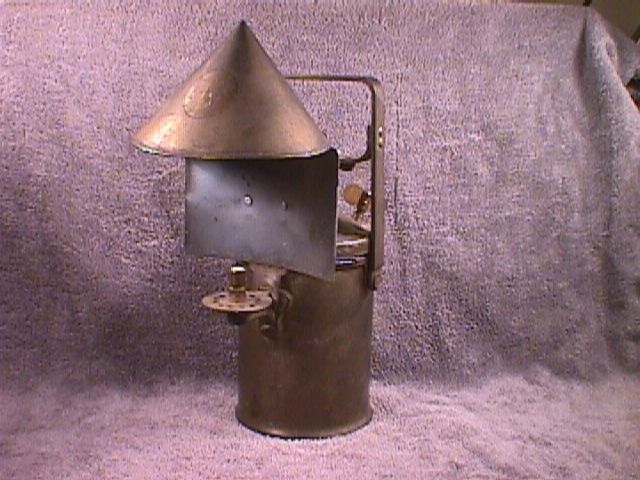 For me, this is the most beautifully designed of all aluminum lamps, incorporating all the advantages mentioned above in the description of the cap lamp, without the problem of insufficient carbide capacity, and with the added bonus of a plated reflector mounted over a full-support cast aluminum reflector brace, so the miner had a polished reflector and one that wouldn't get easily bent. Has a handle for carrying and aiming, plus a hook and bail for hanging the lamp from a timber or rock projection at the working face. 5 3/4" high to the top of the water valve control lever. A very very nice lamp with only a single small flaw: the thumb tab on the water door has been broken off. Otherwise a rather perfect example. 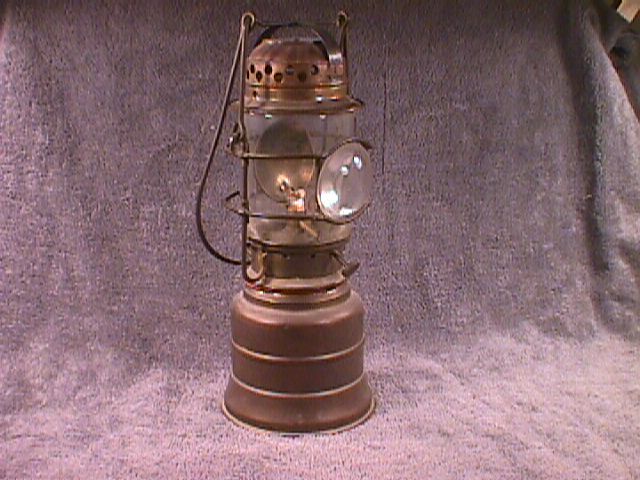 MC-1: MAPLE CITY CAP LAMP: [NLA] The Maple City is one of the stranger designs among carbide miners' lamps. The carbide bottom is female-threaded and screws on over the male-threaded bottom of the water tank. Screw-in water cap has a retaining hook to keep it from getting lost on the floor of a mine during refilling. 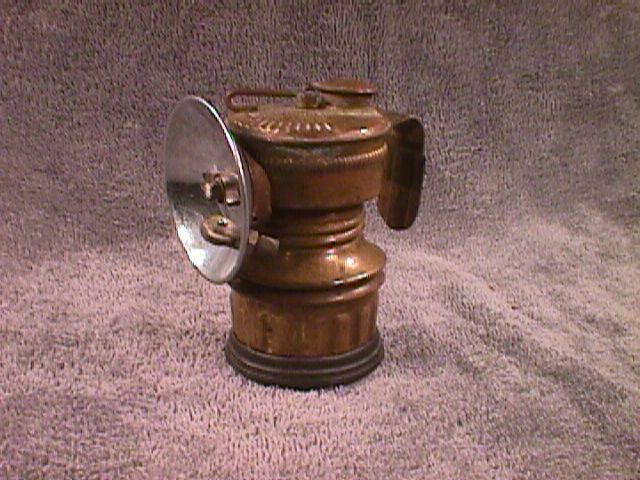 Lamp is 3 1/2" tall to top of water valve control knob. 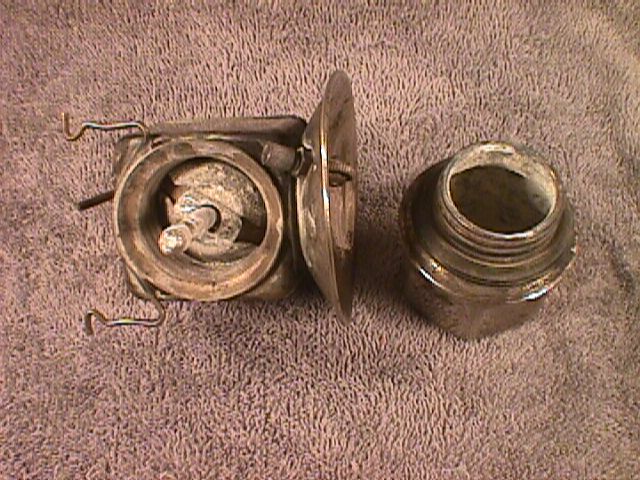 This example is missing its reflector, and the hook has been resoldered (possibly not the original hook); some dings, especially in the water tank. This rare lamp probably saw its working days underground in the coal mines of Kentucky/Tennessee. I collected it (and the Brite-Lite described above) in Whitley City, Ky. in the late 1960s. MAPLE CITY CAP LAMP, missing reflector. 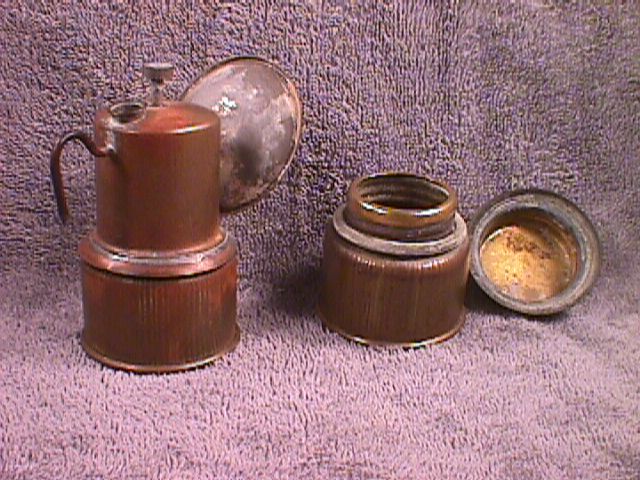 MAPLE CITY CAP LAMP, disassembled. MI-1: MILBURN No. 22 LAMP: [NLA] According to a description in the 1920 R. H. Hyland Co. catalog, this steel area lamp was "especially adapted for use in mines and tunnels. It may be furnished with open jet burner or with transparent mica windshield or 6-inch aluminum reflector. The burner joint is universal so it may be swung either horizontally or vertically." The Milburn 22 stands a full 11 inches tall to the top of the sealing thumbscrew, and the body is approximately six inches in diameter. 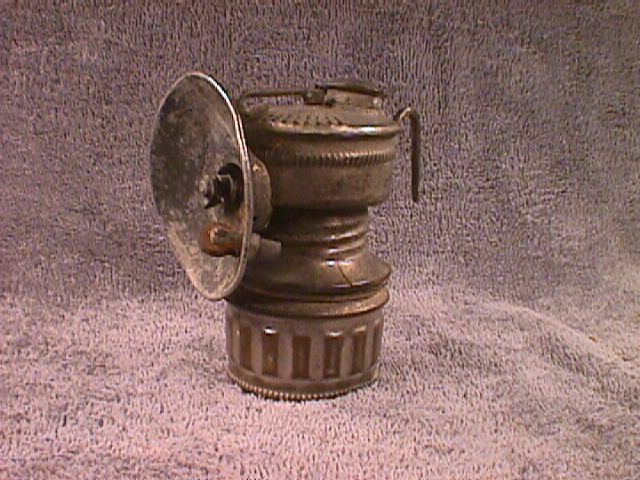 This particular example has the 6-inch reflector, with a forked burner tip that is a full inch across. The normal carbide charge was 1 pound (!) of carbide; water was added to the tank by unscrewing a flanged disc at the top of the concave-dished water tank, and pouring the water directly onto the tank top-- the concave dish funneling the water into the tank. This example is in working condition-- I have fired it up-- although there is some leakage around the old gasket. When operating at full capacity the lamp is rated at 100 candlepower, and runs 8 hours. The history of this lamp is the same as that of BW-1. PLAQUE ON FRONT OF MILBURN No. 22 LAMP. MILBURN No. 22 LAMP READY FOR CHARGING. 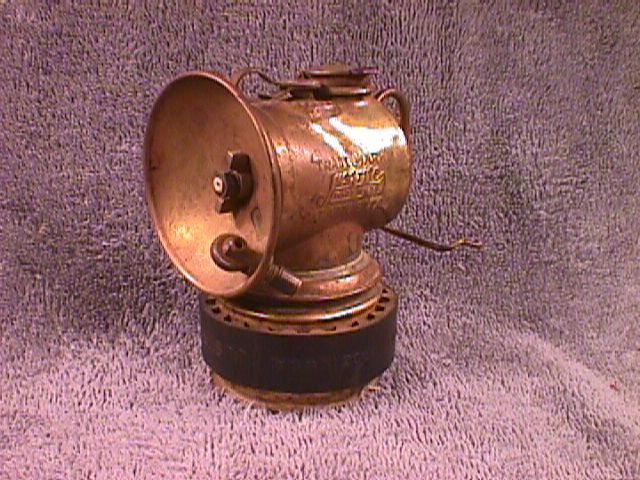 PI-1: PIONEER CAP LAMP: [NLA] This brass carbide cap lamp was manufactured by the John Simmons Co. and carries the familiar Simmons diamond-shaped logo on the water tank; Baldwin patents are also acknowledged on the water tank. Nowhere does the name "Pioneer" appear on this lamp, or, as far as I know, any lamp. But the advertising copy for these lamps shows that they were sold under the name "Pioneer", and the boxes were also marked "Pioneer", so we have the Pioneer brand, even if we have no lamps marked Pioneer. Lamp is 4" high to the top of the water door; 2 1/2" plated reflector screws on; lava tip with the Simmons diamond trademark shape. This lamp has been fired, but probably never used on a work scene-- excepting tarnish and some spotting on the reflector plating, this lamp is perfect and perfectly complete and original. 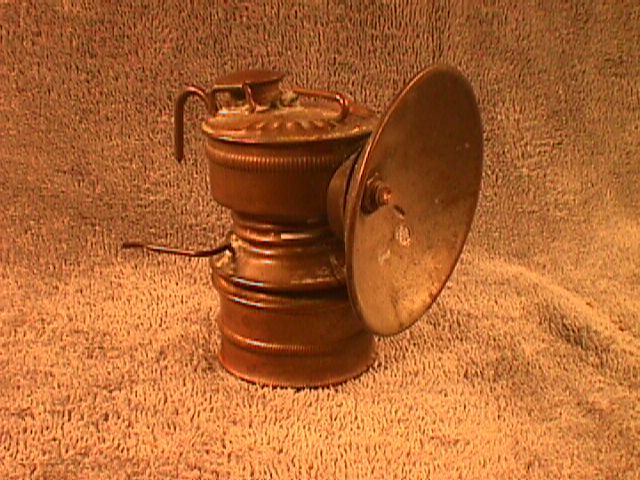 PIONEER CAP LAMP, side view. 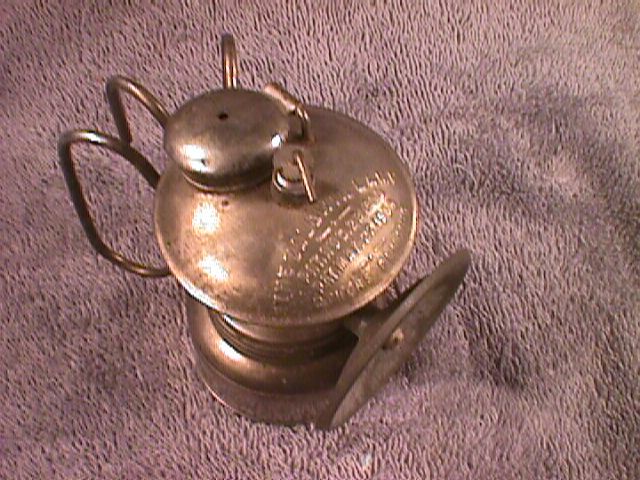 PIONEER CAP LAMP, top view. 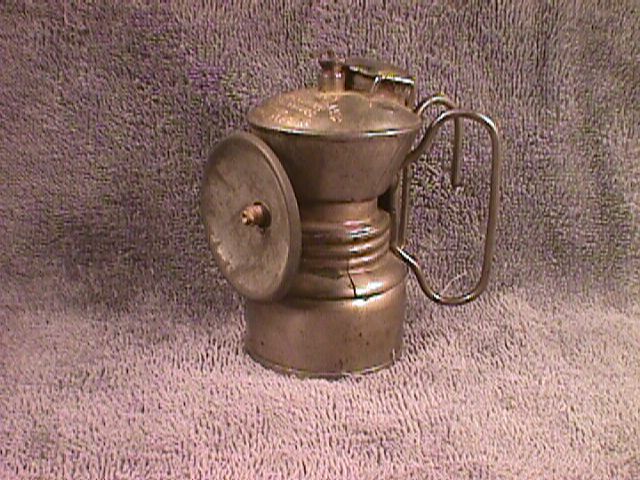 SM-1: SHANKLIN METAL PRODUCTS CO. CAP LAMP: [NLA] The Shanklin Metal Products Co. made a carbide lamp that looked nearly identical to the Guy's Dropper lamp manufactured at the same time by the Shanklin Mfg. Co., and therein lies a tale, which you can read about in Pohs' big book, pgs. 480-481. But to summarize, the three Shanklin brothers disagreed about what to do with the original company, and brother William set up a new company, the Shanklin Metal Products Co. 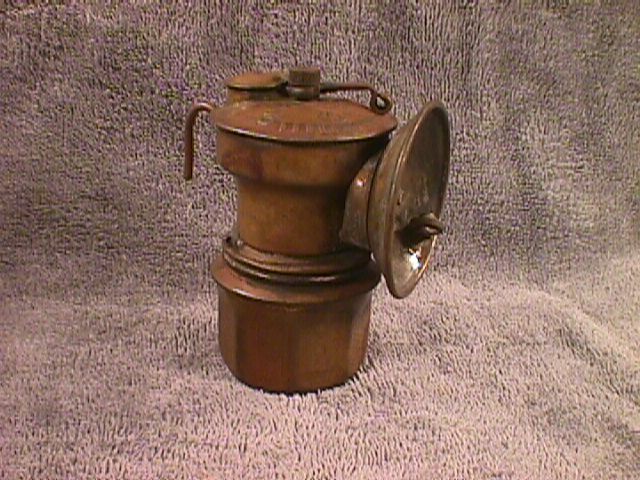 The lamp pictured below is a SMP lamp, and the bottom of the carbide base is clearly marked "Shanklin Metal Products Co., Springfield, Ill." But on the top of the water tank the name "Shanklin" has been neatly obscured with solder, leaving only the "Metal Products Co." portion of the name showing. A number of lamps have been found in this condition, suggesting some dispute went on over the rights to the use of the name Shanklin. Lamp stands 3 1/2" tall, is equipped with a 2 3/8" non-plated brass reflector of the type shaped to fit against the water tank, obviating the need for a separate reflector brace. Wire side braces are sloppily soldered on, and are probably a remake job. No stress cracks, no dings; just a little corrosion spotting here and there; lamp is very shiny and appears to have been buffed by a previous owner. 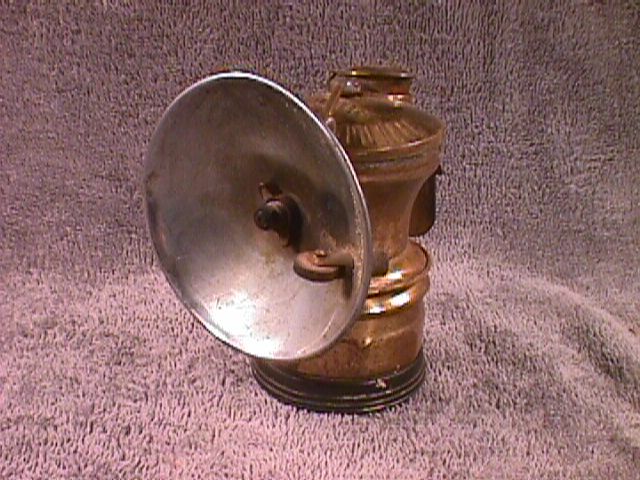 I bought this lamp in 1978 at The Silent Woman Antique Shop right in the hometown of the Shanklins-- Springfield, Ill.
SHANKLIN METAL PRODUCTS CO. CAP LAMP, side view. 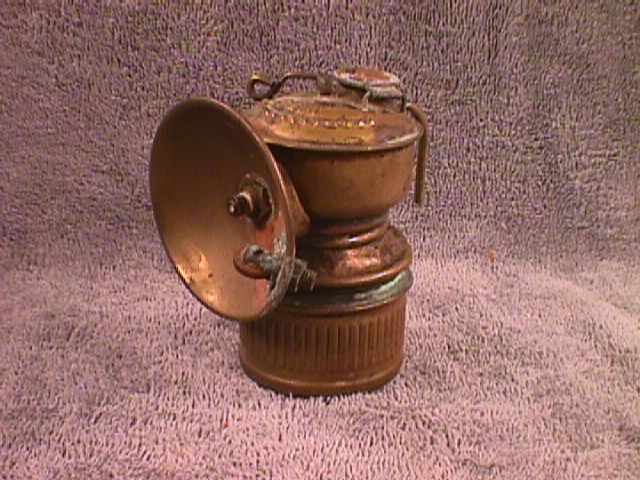 SHANKLIN METAL PRODUCTS CO. CAP LAMP, from above. SP-1: SPRINGFIELD CAP LAMP: [NLA] This Springfield cap lamp must have seen some real working days, for the water control lever has worn away some of the lettering on the tank top. Nonetheless, the lamp is complete and without much in the way of dings. Its major flaw is a hole about a quarter inch long formed at one of the angles in the octagonal base. I've seen stress cracks on a lot of lamps, but never before a hole with the appearance of being the result of corrosion. Don't know how it got there. Reflector is 2 1/2" in diameter and made in an unusual "coolie hat" shape; it is held on with a hex nut, there being no reflector brace, but a collar on the gas tube that the nut screws down against, with the reflector in between. 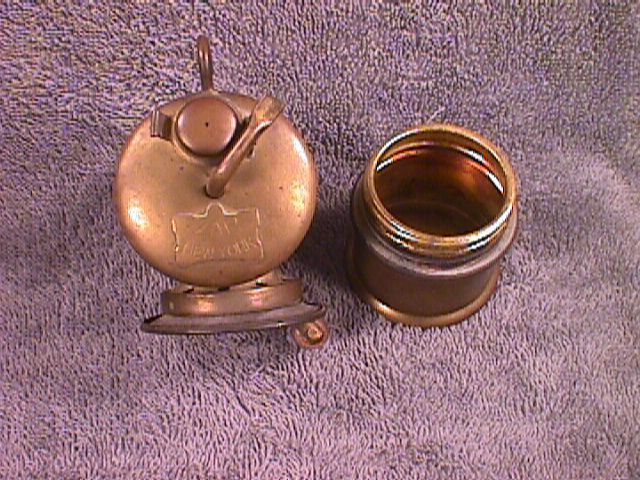 SPRINGFIELD CAP LAMP, side view. 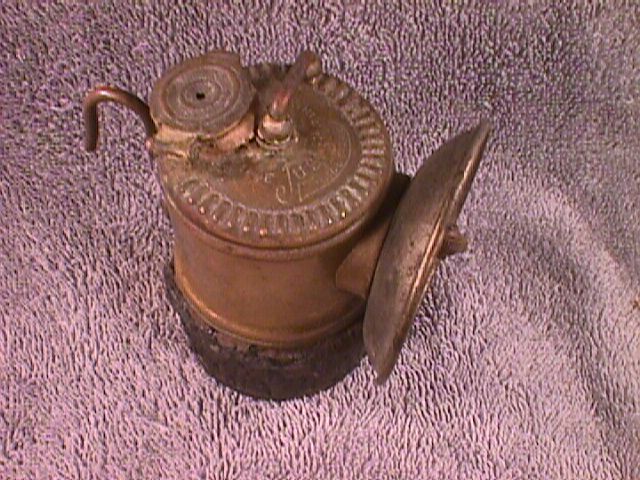 SPRINGFIELD CAP LAMP, top view. SQ-1: SQUARELITE CAP LAMP: [NLA] In my volumes of info on carbide lamps, I include the Squarelite under the section on Guy's Droppers. After all, it bears the name "Guy's Dropper" on the water tank, and the 1916 patent sheet makes no claim for anything other than an "ornamental design" by George R. Shanklin. Yes, the Squarelite was nothing but a Guy's Dropper with an ornamental body shape. So what are we doing way down here in the "S" department instead of being up in the "G"s? I don't know. Could be I was teasing those who came down the list alphabetically. Or could be the Squarelite is so very distinctive in form, that I, and I suspect most collectors, think of it as a separate brand name, even though it really isn't. Anyway, here we are, and here is a very very fine lamp with a unique history. This nickel plated Squarelite is complete, apparently completely original, and in very excellent condition. Soldered on wire side braces are in perfect shape, the plating is good and there are scarcely any dings (one slight crease in the 3 plated reflector, and a barely discernable mash in one side of the water tank). Lamp stands 3 7/8" tall to the top of the water door. On this model the shield bearing the name "SQUARELITE" (on the right side of the water tank) is fully visible, although the shallow stamped lettering does not come out in the photo well at all. No doubt about it, this lamp is a rare jewel; now take a look at its history, and you'll see why it is even more special than you might imagine. Lamp history: This lamp was the personal property of Mr. Joseph D. McGill, who began working for the Shanklin brothers in 1916 at age 16. McGill told me he began by soldering bottoms on the porch of the Shanklin house, before they had a proper factory building. He stuck with the company through its buy-out by the Universal Lamp Co. He eventually rose to become Secretary-Treasurer of the Park-Sherman Co., the successor company to Universal after their move from Illinois to Tennessee. I first interviewed Mr. McGill in 1966 (see Pohs' big book, pg. 472), just prior to his retirement, after 50 years service. Later, I visited him in his home back in Springfield, and acquired this lamp from him in 1978. I have a letter of documentation from Mr. McGill. Yes, a very special item, this one. SQUARELITE CAP LAMP, right side. SQUARELITE CAP LAMP, from above. SQUARELITE CAP LAMP, ready for carbide charging. 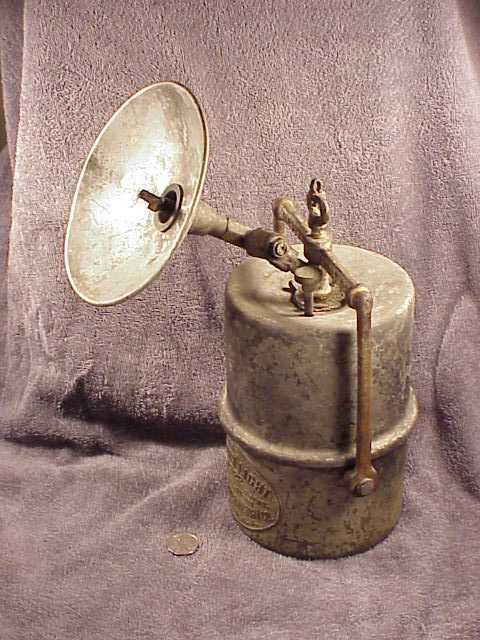 SR-1: SUN-RAY CAP or HAND LAMP with "HAN-DE-HAN-DEL": [NLA] The Sun-Ray lamp by the Dewar Mfg. Co. is one of the most beautiful of all carbide cap lamp designs: sun-burst on the reflector and smiling sun emblem on the water tank top. Another unusual and attractive feature is the numbering of the water valve control notches. 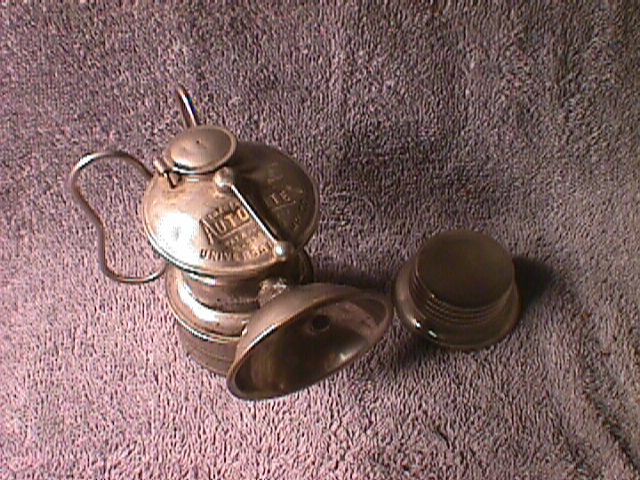 Lamp is nickel plated, and features the 3-position "Han-de-Han-del" that allows it to be carried as a hand lamp, or, used as a cap lamp with the handle folded back. Lamp is 3 1/2" tall to the top of the water control. Lamp is complete and completely original. SUN-RAY CAP LAMP with 3-position "Han-de-Han-del" in up position. 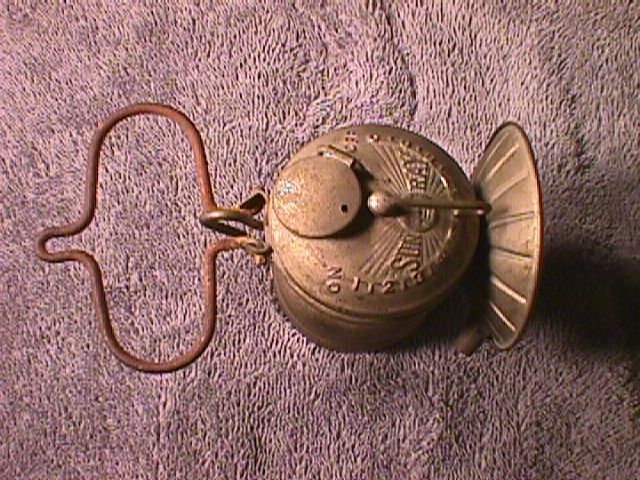 SUN-RAY CAP LAMP, top view with 3-position handle in horizontal position. VC-1: VICTOR CAP LAMP, non-Justrite, FIRED BUT UNFIRED: [NLA] This 4" tall, very primitive, early cap lamp is unmarked, but is the Victor brand cap lamp that was made before Justrite acquired the Victor name and produced a very different lamp (see next description below). I have a xerox of a Victor box depicting this lamp, and using the brand name Victor. This particular lamp is unfired, in that it has never been charged and lit (some white residue inside the lamp is from Brasso); on the other hand, it has been "fired" in that it survived a fire. The heat of the fire may be part of the reason that almost all the thin plating is gone from the tilted reflector. Bottom has a number of stress cracks on all sides, none gaping open. Maybe these cracks resulted from the heat of the fire, or maybe just from the combination of age and the very thin gauge brass used. The lamp comes with a spare bottom with screw-cap; this bottom is also plagued with numerous cracks. The most serious flaw is that the screw-in water door has been lost. But at least one the two pictured in Poh's big book on pg. 455 seems to be in the same state; maybe the water doors weren't chained and got lost commonly? This is a very scarce brand name that won't be offered to you very often! 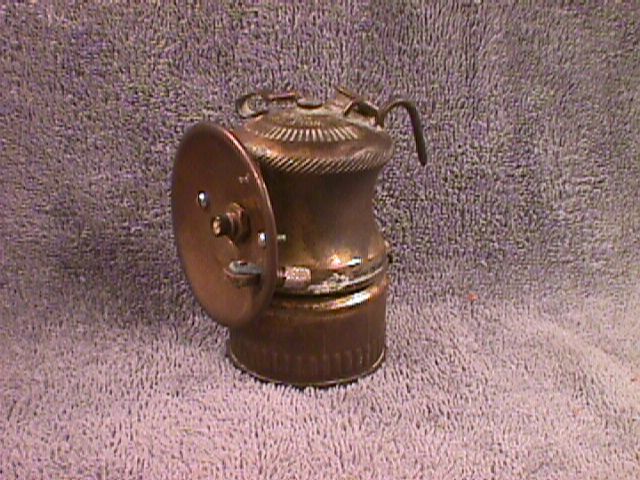 Pre-Justrite VICTOR CAP LAMP, left side. 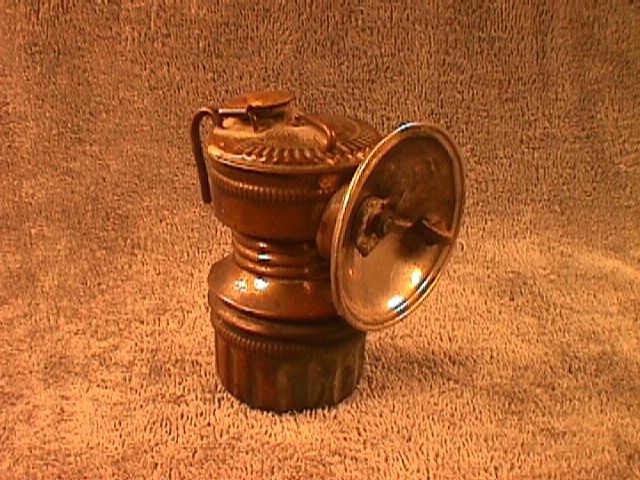 Pre-Justrite VICTOR CAP LAMP, right side. VJ-1: VICTOR CAP LAMP by JUSTRITE: [NLA] Brass Victor cap lamp manufactured by the Justrite Mfg. 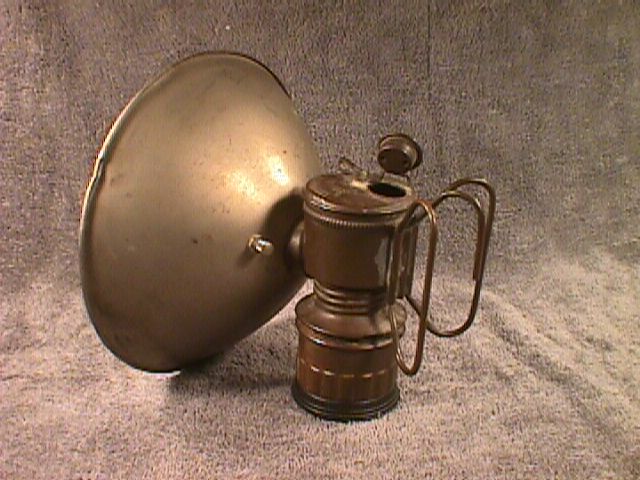 Co. Lamp is 3 1/2" tall, with 2 1/2" unplated brass reflector that is creased around the reflector brace a bit, probably the result of the lamp being struck against the mine back. The side mounting braces are of the flat type, rather than the round wire type. Water control is Justrite's patented "Polygon Feed" type. Flaws: main mounting hook has been sloppily re-soldered; water door is mashed; some minor dings. But lamp is complete, including the original knurled nut holding the reflector on; a pretty nice example of the marque. VICTOR CAP LAMP, side view. 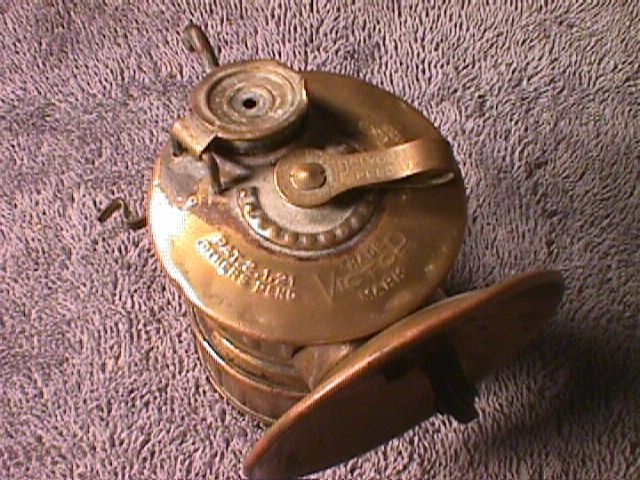 VICTOR CAP LAMP, top view. 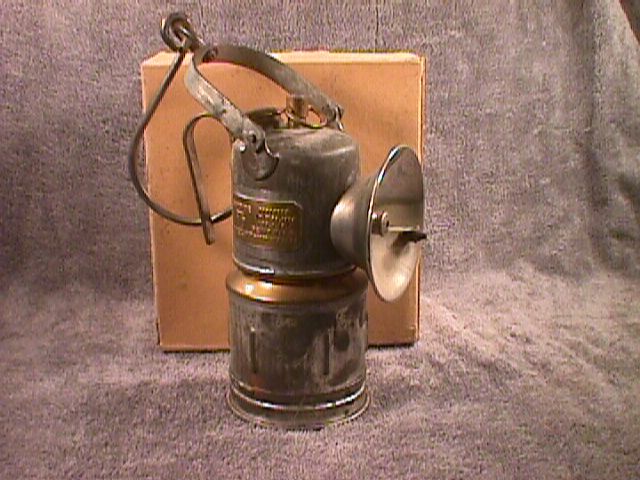 WF-1: WOLF CAP LAMP: [NLA] A Wolf Safety Lamp Co. of America product, this is a later (mid-twenties) "dome-top" version of Wolf's Model 911C cap lamp. 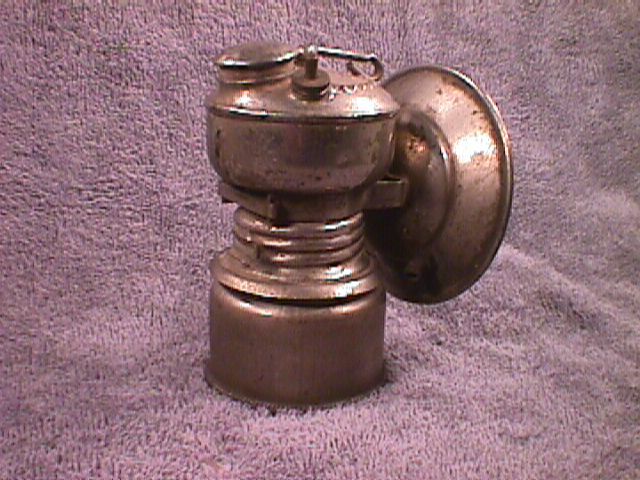 Lamp is 3 1/2" tall, sports a 2 5/8" diameter, unplated brass reflector secured by two small screws to the reflector brace (screws in this example are replacements). 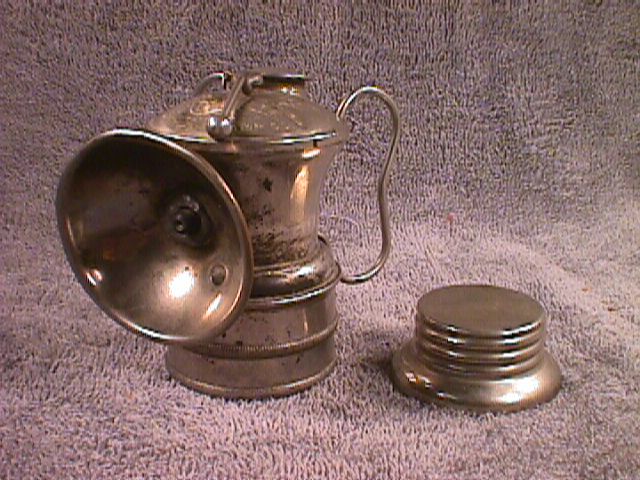 One interesting feature is that the top is stamped "Wolf Cap Lamp"; this is the only carbide lamp I know of labeled to tell is it is a cap lamp not a hand lamp-- as if we hadn't eyes! Flaws: carbide base has a number of stress cracks; side mounting clips are broken off; lighter unit looks like a replacement. WOLF CAP LAMP, side view. WOLF CAP LAMP, from above. 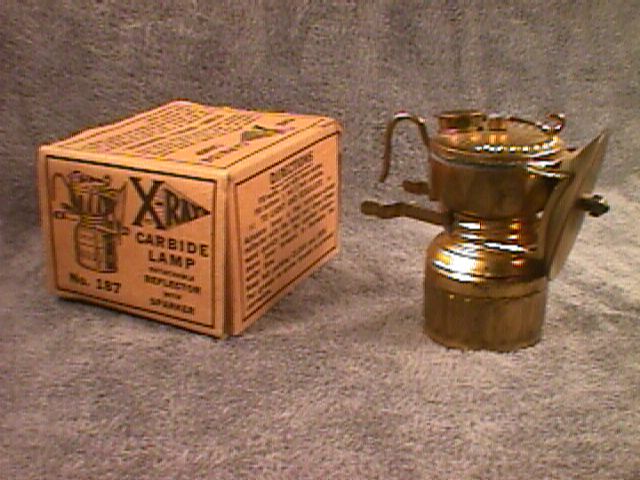 XR-1: X-RAY CAP LAMP, PRE-JUSTRITE TYPE, UNFIRED, with ORIGINAL BOX: [NLA] This beautiful lamp is identical to the Fulton cap lamp, except for the bottom stamping, which says "X-Ray". Lamp is 3 1/2" tall, has a 2 1/2" unplated brass reflector tilted slightly downwards, secured to the complicated reflector brace by a round knurled nut, through which protrudes the vented unjacketed lava burner tip. This lamp is in BEAUTIFUL condition: not a ding on it, and it retains most of its original finish brightly (lamp has NOT been polished!). The box, on the other hand, though complete, has suffered some damage, as can be seen in the photos. For more information, see Pohs' big book, pages 440, 452, 455 & 456. X-RAY CAP LAMP, UNFIRED, right side. X-RAY CAP LAMP, UNFIRED, left side. X-RAY CAP LAMP, UNFIRED, inside view. AA-1: ZAR CAP LAMP, UNFIRED: [NLA] For novelty of appearance, only the Ever-Ready equals this lamp, in my opinion. In fact I think it should have been named the "BI-ZAR" it's so weird looking. Just under 4" tall to the top of the water control ("control" is a gross exaggeration for this simple wire), with a 2" diameter screw-on reflector that was only very thinly plated-- 50% of the plating is gone from age. Novel features include: metal burner tip shaped like a cap that press-fits onto the gas tube; five vent-holes in the reflector (what purpose did they serve? ); water door that is a hollow cap that presses down over a raised lip; single mounting hook with no side braces for stability. This lamp is complete, original, and completely original. It is close to perfect; one tiny tiny ding in the base, and one on the crown of the water tank. Several Zars are pictured in Pohs big book on pg. 407; there are two styles of markings: one with the name ZAR in incuse letters, the other with the name ZAR on a cute little brass plaque attached to the top of the water tank. This lamp is of the second type. 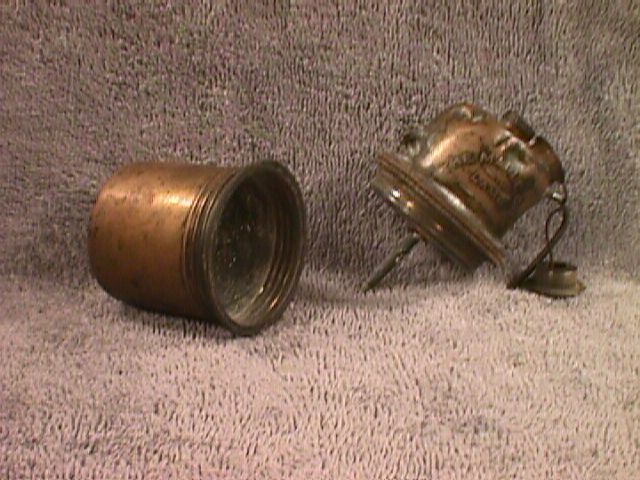 Lamp history: Same as the unfired Baldwin and Grier cap lamps described above: originally bought for use at Cudjo's Cave, Cumberland Gap, Va.
ZAR CAP LAMP, left side. 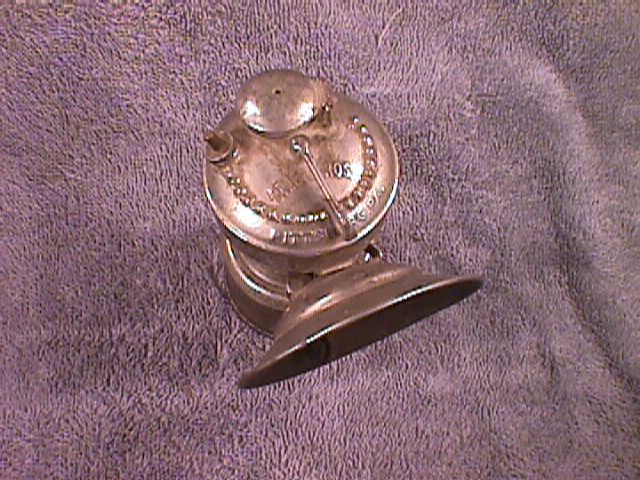 ZAR CAP LAMP, right side. ZAR CAP LAMP, ready for charging, but don't you dare! IN MEMORY OF HENRY: Henry, you were the finest of the lamp collectors. You were always generous with your immense knowledge of our special interest. You were true to your passion right to the end, never thinking of quitting, but always searching for that missing brand name or new variety. You were my friend for thirty three and a half years. I thank you. You will be remembered and missed. For something completely different, see Rutahsa Adventures homepage.